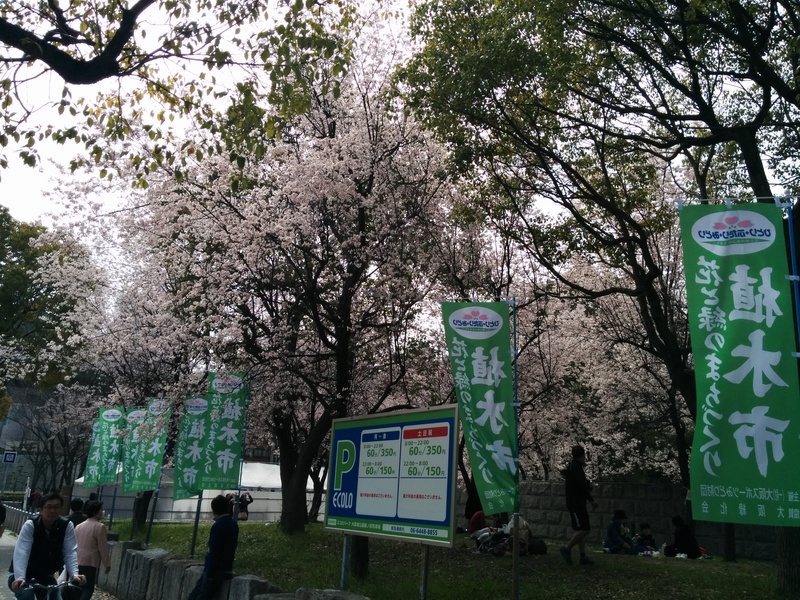 Spring has arrived in Osaka. 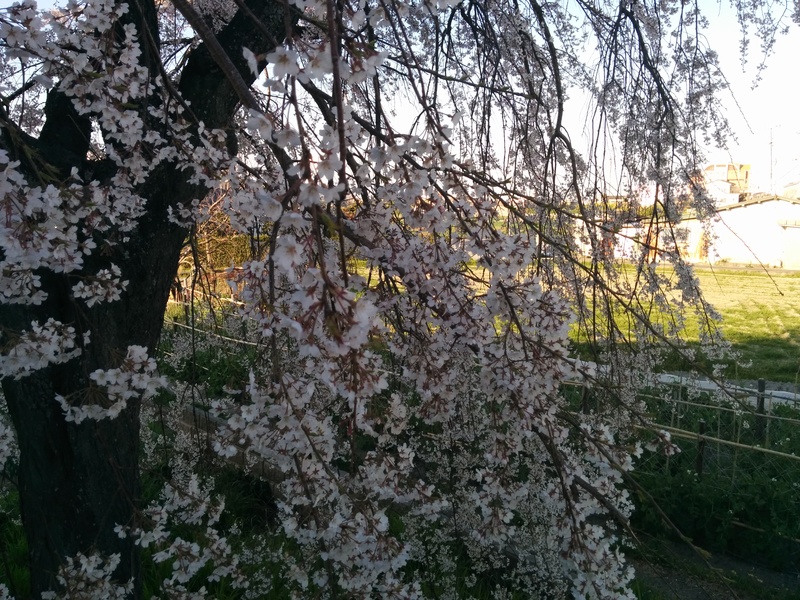 My favorite Sakura tree is in bloom and flowers are popping everywhere. I have started this years spring planting. 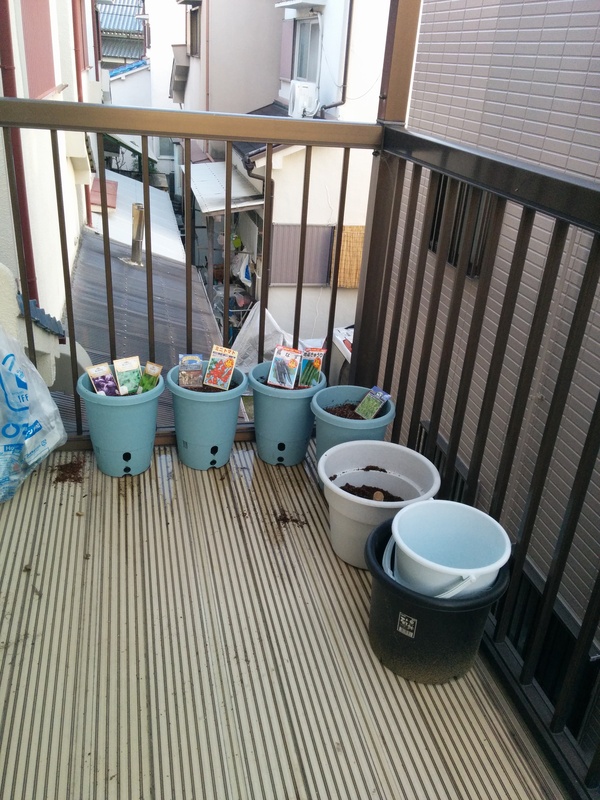 I am going to try out an upstairs, back lanai veggie planting center. 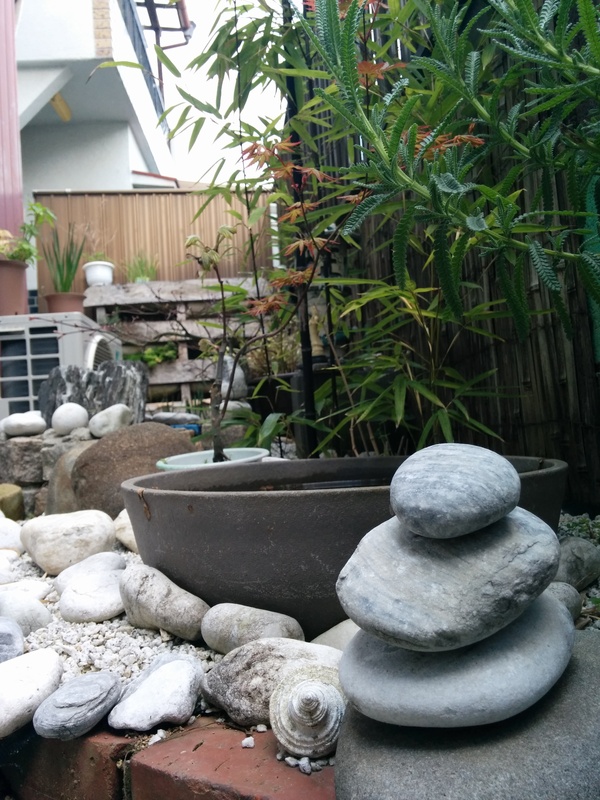 The front yard is the bamboo garden, starting its second year. The growing there last years was not great. Only a few herbs did ok in the small based planters. So the front is dedicated to that and misc bamboo and flowers. The upper back garden is in lager pots , to give some earth to grow in also the light there is better. I think that was another issue the veggies had in the front n the vertical planters. This year, tomatoes, peppers, cukes, basil, kale, lettus, eggplant are planted in the upper back forty. Well see how that goes. I am hoping to get a variety of basil. Hopefully enough to give away some, and also make a lot of pesto! We had our monthly gig at the Chicago rock blues club. I would say it was by far the worst ever! At least in my opinion. We had a couple of people sit in with us. First it was a trumpet player. He is good!! I have played with hom before and enjoyed it. It gave us a nice classy sound, and we did nt play loud. It was very cool! Sadly he left too soon a guitar player joined in afterward, it went down hill from there. The band got loud, the leader got a new guitar box with a wah wah pedal or maybe it was old and he did not use it often. Anyway he and the other guitarist went off on some loud riff trip and it hurt my ears. I am sure the ears of others as well, since I saw the girlfriend of the leader plug her ears with her fingers. I had stopped playing at this point and was just holding my ears as the guitars went off. Other songs before that went into some loud bad acid trip sound. It is too bad people did not start coming in until after the trumpet player left. It was already late when people arrived, and we ended up doing an extra set so they could hear the band. Too bad they heard loud crap, at least in my opinion. The drummer’s comment afterward was, something like: it is good (or interesting ) we have a flexible sound. I just said Mmmmmm. I was not pleased with the end product of the night. Maybe it was just me…and my taste. In other band news. I think we are scheduled to do another concert in Kyoto this summer. Kinda sorta nice, it is a free showcase, kinda of fun. Some good picture and a recording come out of it. So that is something. 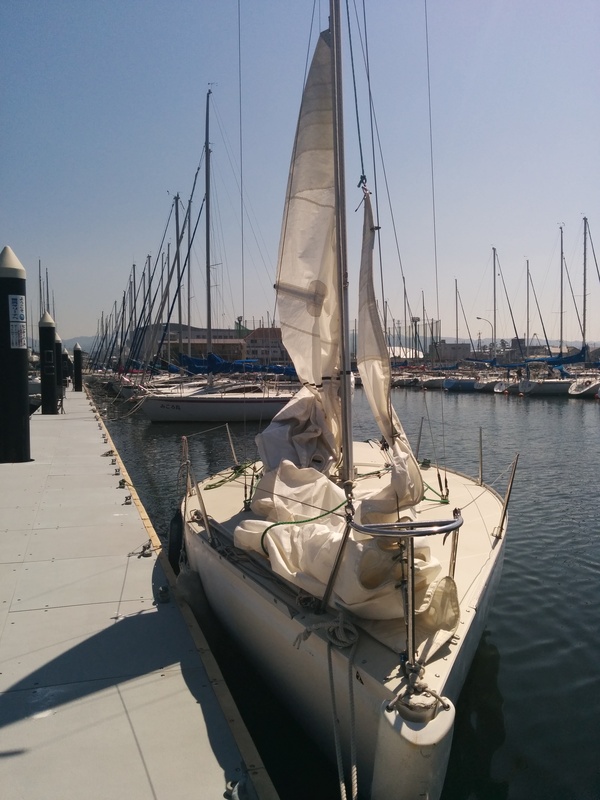 Surprisingly I have been getting a fair amount of sailing in which is posted on the sailing blog. Not really as interesting as my old sailing blog with my solo and duo adventures. However it is sailing at least. At least sailing as far as teaching class goes and still getting some sailing time. Sometimes more fun and interesting than others. Sometimes a trial of my patience and teaching skills. Like this last person the friend of the friend. One recent student came about via the band. A friend of the band drummer has been wanting to learn sailing, and actually followed through on his talk of lessons. Not much work has been coming in from the Landscaping part of life. AT least from the city work. I am guessing it will not start serious until late spring, when the grasses, weeds , bush is really started to grow in the lots and such.In a way it is good, I get a rest from that type of work, Especially like today when I am healing from some unknown knee and neck pain. Also just having a break. On the bad side it means funds are/will be low, for travel, goodies, etc. The extra sailing classes have helped so far, but I doubt if it will maintain the pace it has the last few months. 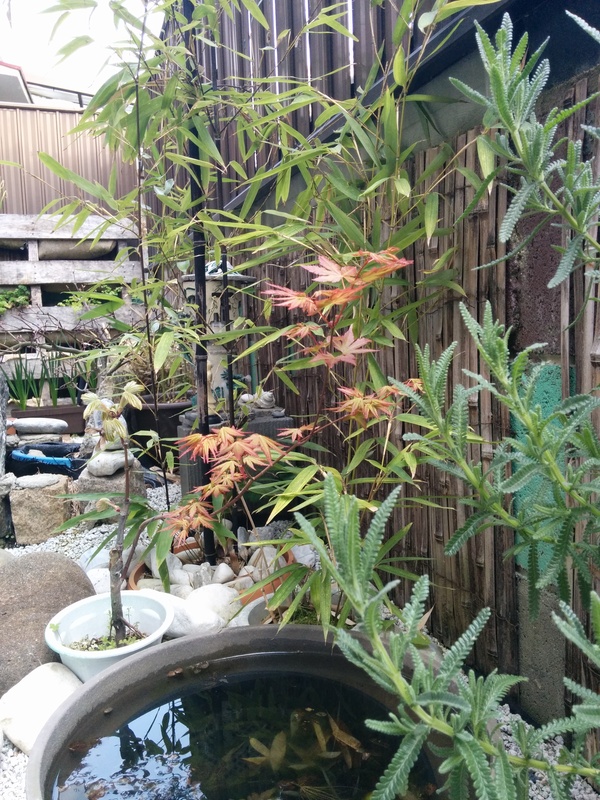 On the other hand, I have been recalled to tend the Aoki Yard as the weeds have started filling in. This bit of work will cover my Shakuhachi lessons. 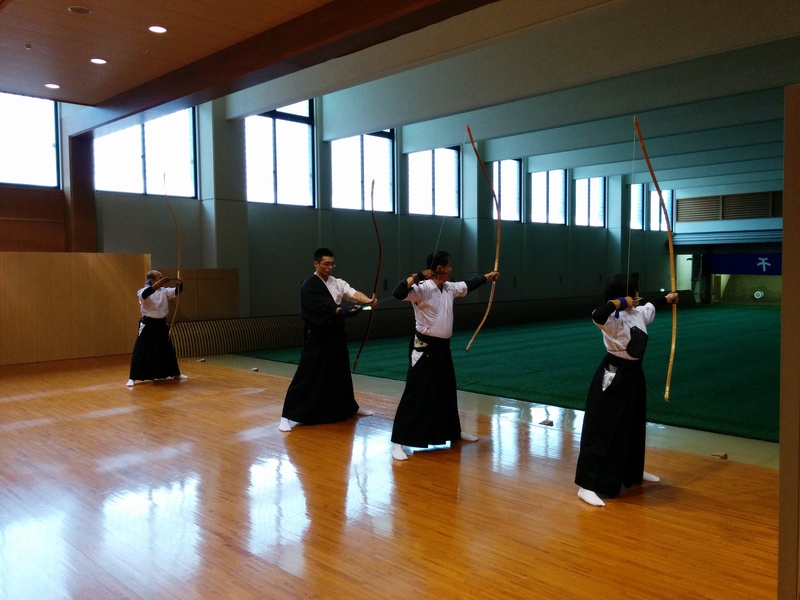 Kyudo practice will need to be attended again at least once a week via bicycle and save that train fare expense for elsewhere. It is not all fun and games, in retirement, but being grateful for what is, keeps what is not in perspective. And that’s the local news. What is a snafkin you ask yourself, since I am not there. Ahh I Reply, because I can read your thoughts. Well you will fnd out later. However before that, lets back up to before the word Snafkin existed in my mind. 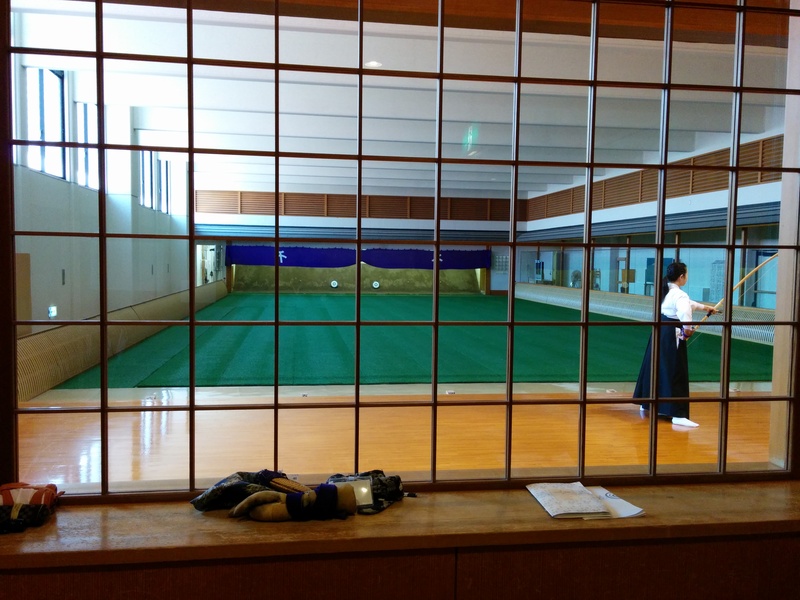 I went to Kyudo, first day of practice since the shinsa. Not many there today , I found that a bit surprising. But no concern of mine. I set about working. I sempai was there, and getting ready to leave. He also did not pass the Yondan, he aked if I was going to the next shinsa. Hai, I replied. He then set about correcting, adjusting my tenouchi power points. He was trying to help me to not have the bottom on my Yumi swing out after hanare. I took it in and added that into my practice for the day. Clock is ticking on the next Shinsa. I told my Sensei in the states I did not pass. He said it took him 4yrs to pass. I am guessing that based on testing in the states @ once a year. For that would be 4 attempts. If in Japan it mean 12 times! Well, I am focusing on doing it on my second attempt. Even though I do not feel really on “it”, right now…ayway..Yosh! It was the worse day ever as far as hits. I think I got two out of 18. I generally put in two hours min at the dojo. Today I only did 1.5. 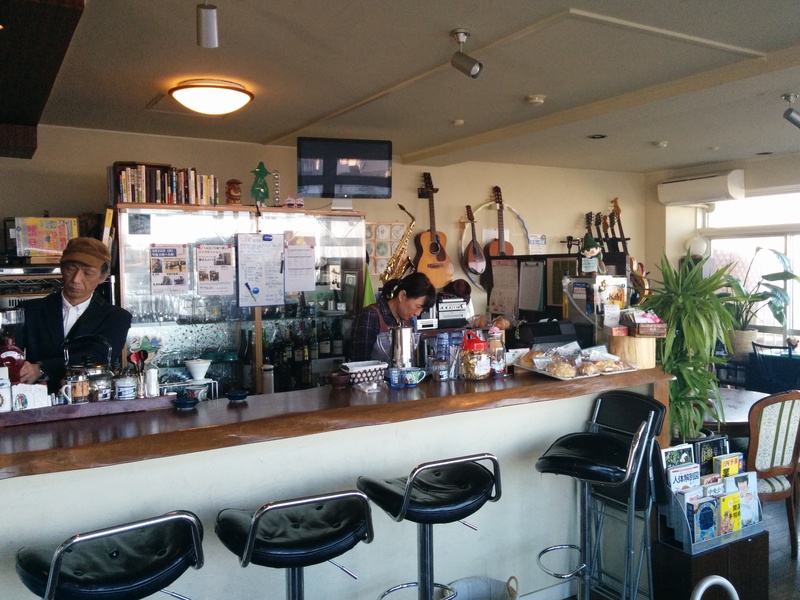 Two of my sempai, the one that plays, classical guitar and the Shakuhachi player asked me if I would like to go to some coffee-house they played at and talk with the owner. If I was free today we could go at 4:00 pm. So all this was said in Japanese, so it took me a while to figure it all out. This is what it all meant. So I was leaving early today. 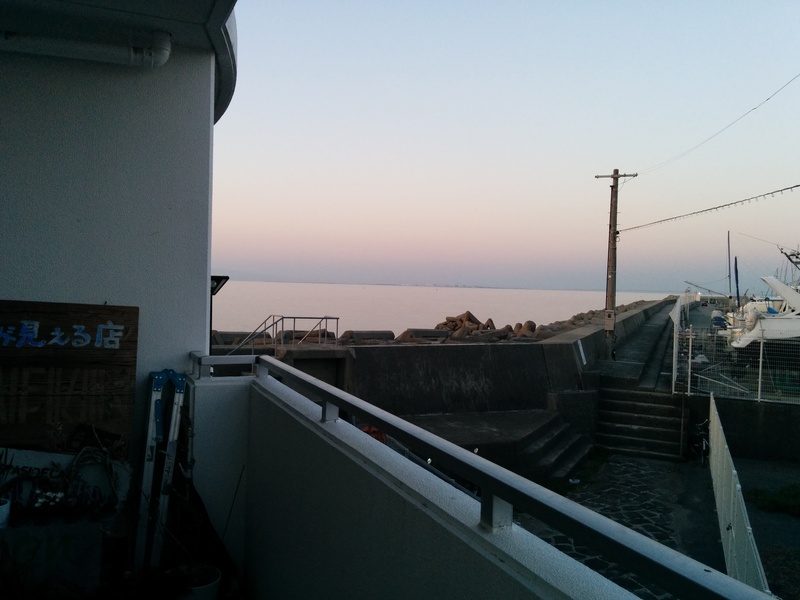 I was given a ride to this coffee-house not to far from Aoki Sensei’s house, right on the Bay, next to a marine. Small but homie. I was introduced to the owners, they are about my age, and also my sempais with me share the age bracket. Turns out I am the youngest of us, by a year or less. Anyway the wife of the couple is an ex-English teacher, she has been to San Francisco, we can talk. The husband also speaks English a little, he says. He finds out I am a musician from my sempai. The husband and I end up jamming a little together. Him on Guitar, me on Bass. It was nice ! Acoustic Guitar, listenable Bass volume, a nice duo. I played some with my Sempai, had tea, hung out. 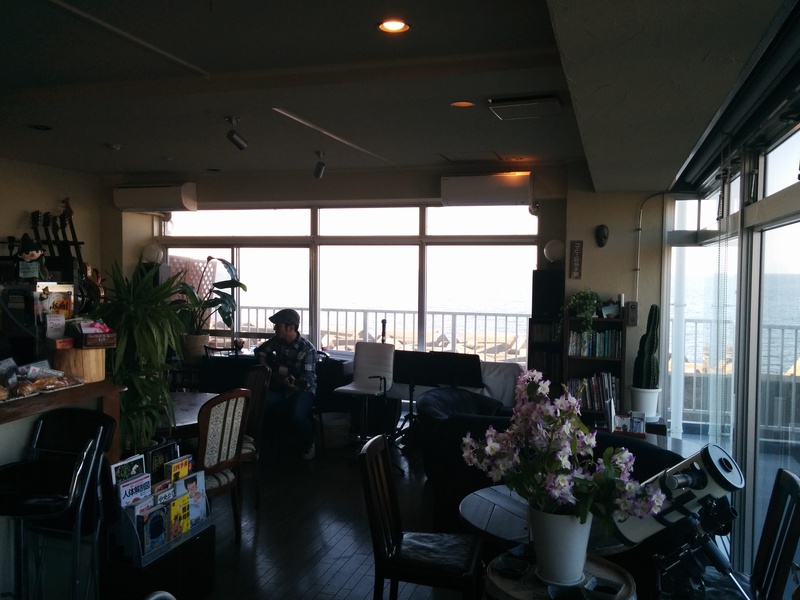 The owner also played shamisen. I learned there is a difference between Okinawan and Japanese style, and to messed around with Okinawan Shamisen. Not a cheap one, so this guy is a real player. I checked out the club, misc instruments, couple seating chairs, sofa, coach, etc, food included snack, sweets, drinks, curries, fresh made coffee and tea. There was also a great Bay view. This place was cool, and comfy. The owners nice, laid back, spoke limited English. I can see me hanging put here on occasion. 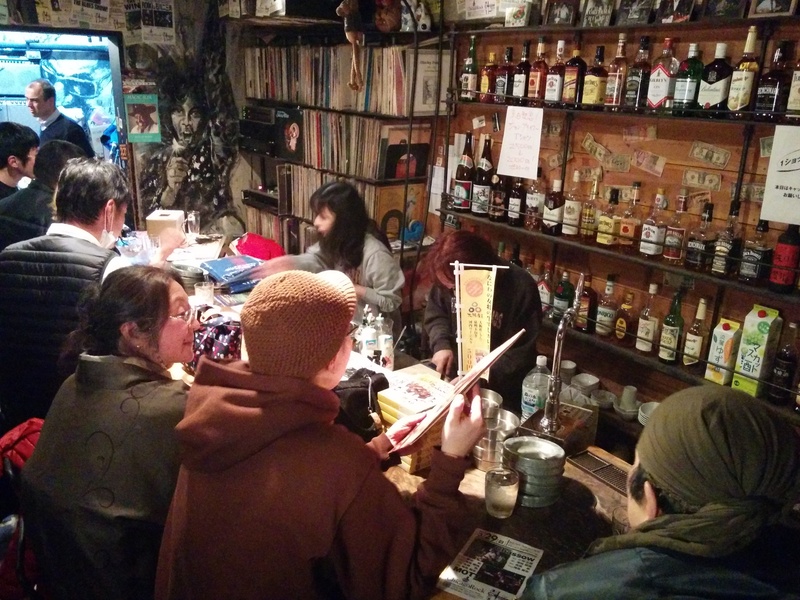 Much better than going all the way to Kobe for me, to jam and met folks. 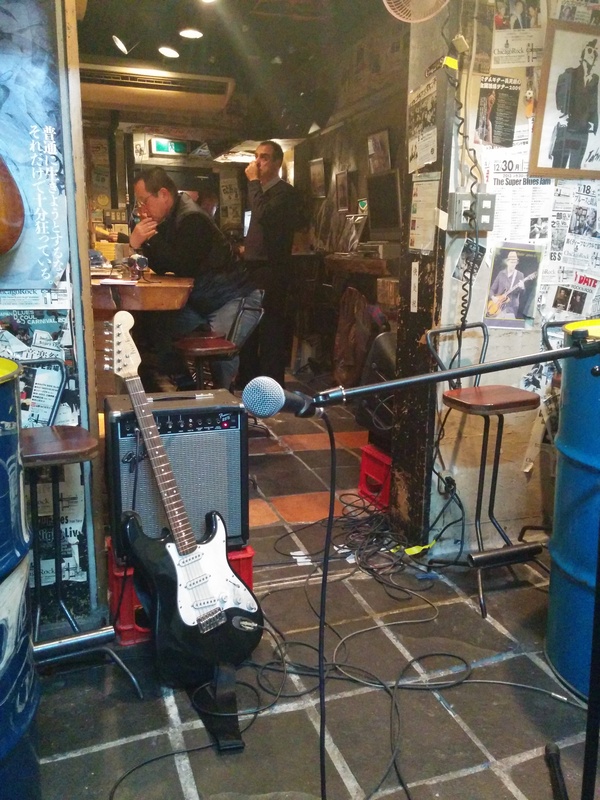 Here, I can meet some local to me musicians, try out some musical ideas with the owner or others. The owners says mostly amateurs come in. That is fine with me. I have heard some good amateurs. Less ego to deal with also if one wants to do something together. This was a great find! I am grateful to my Sempais for taking me there. 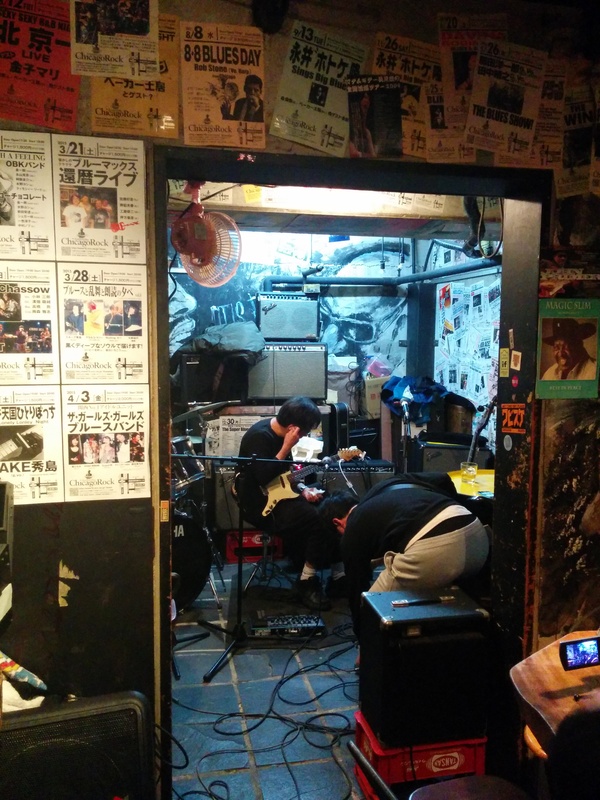 I was hopping to reboot my musical life here in Japan. So far it is working. I am slowly making steps. The band was a good start, and I want to keep it going, but I also want to play other than blues. 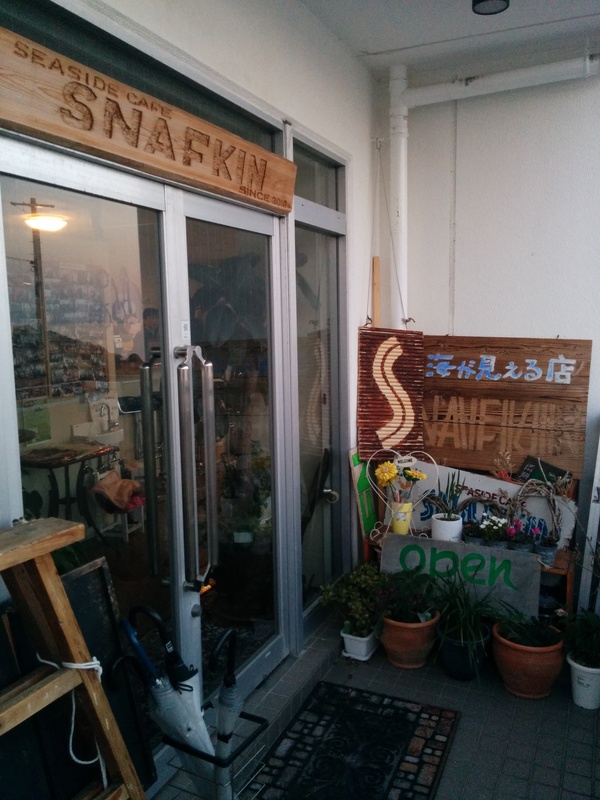 This club call Sanfkin, and the Shakuhachi lessons are a big step into expanding beyond the blues. Shakuhachi Do, finally it has started. Last week was my first lesson. It was interesting. First off there was some background history on the Shakuhachi. Also on breath, and how to breathe correct. That is most interesting, breath, the life force. So major, in Tai Chi, Kung Fu, Kyudo and of course flute, a breath instrument. I see some parallels in the breath with Shakuhachi and the breath with Kyudo. I have not tried this new theory as yet when shooting. I was given a book to read by some famous American Shakuhachi player, who spent time in Japan. Maybe still lives here. He is a friend of Sensei’s. The book is called “the single note”. 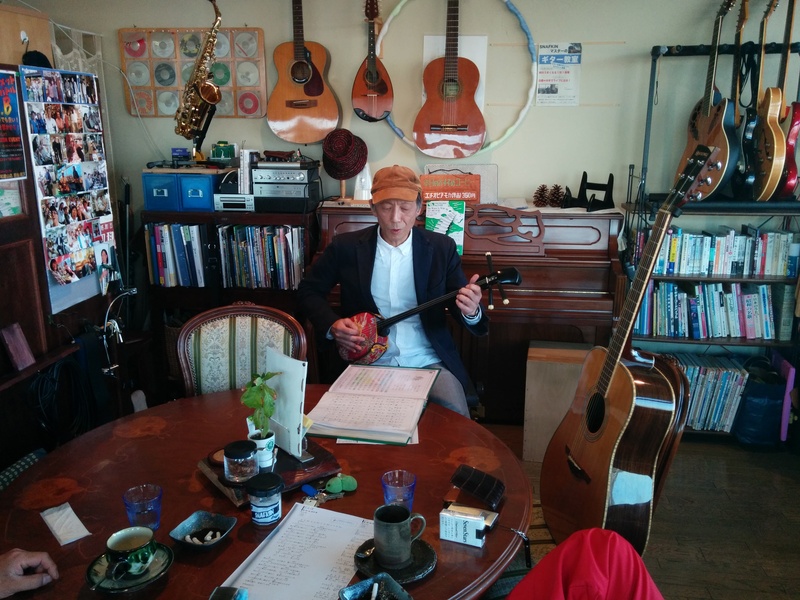 basically the story of this guy’s adventure into the traditional world of shakuhachi. He speaks of the philosophy of the old Fuke Zen buddhist sect. They sought to play the perfect note, one that would enlighten them. Everything was focus on this note , this purity of sound, that would hit the mark in their physic and enlighten them. Something like that. 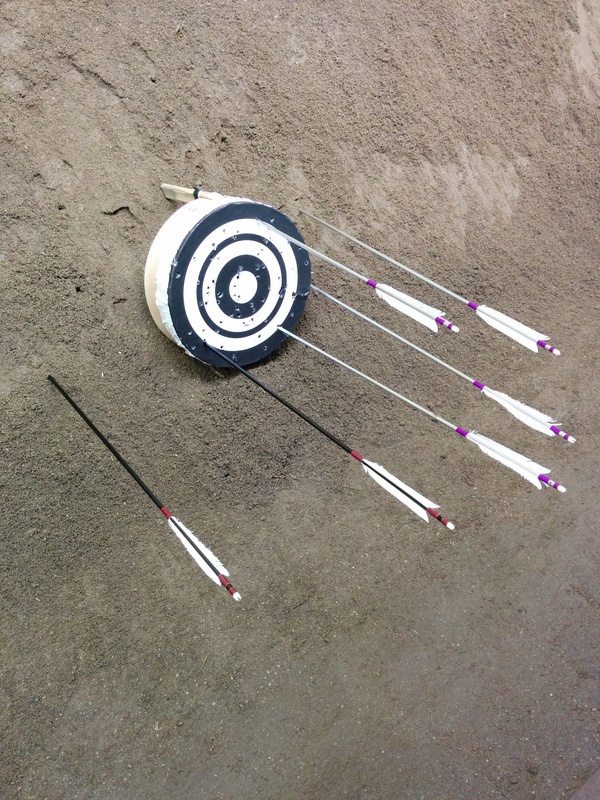 It reminded me of the “One arrow, One life” Philosophy on Kyudo. 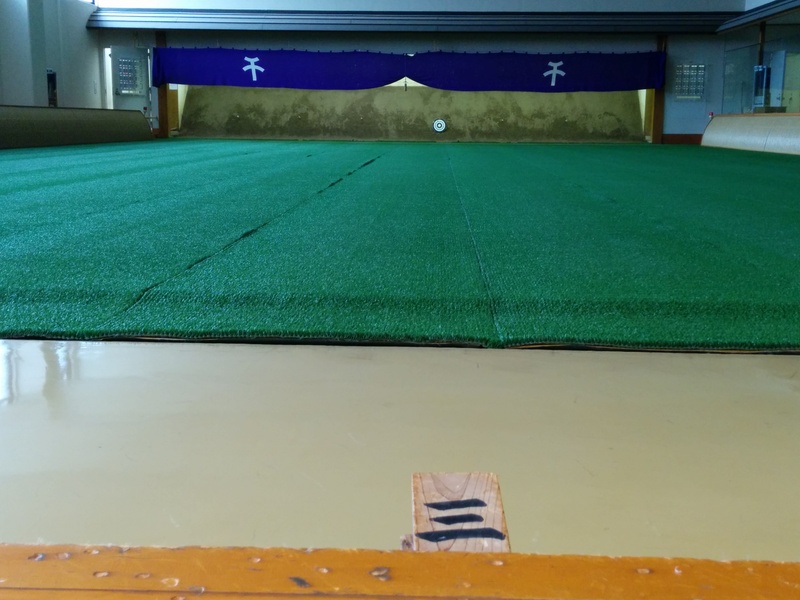 Of some Kyudo clans not caring about shooting 100 arrow a day, but total focus on a small amount even one shot can be enough if totally committed to that shot. The Fuke Zen sect was an interesting story/legend. However they turned to the dark side and got banned, or something, in short. They were other Shakuhachi monks that came later, who were beggars, but the same idea about the music connection and enlightenment” the connection with our higher self being linked into the ” Force” via music, sounds. There is a book by Victor Wooten which speaks of similar thoughts, but he is coming from a Bass view, but the philosophy is the same. However, there is a different connection from making music with one’s breath, than from plucking a string. This is just my thought. Anywho, so Sensei speaks in Japanese then in English for the class. I get to practice both. My background in music theory is coming in handy. I can not read note by note, any longer but the theory understanding is there. I need to upgrade my skill with Katakana since traditional Japanese music is written with Katakana and Hiragana some Kanji, not western notation. That will part of the real challenge, and a good reason to better my Japanese. Sensei had said he was interested in hearing my blues band. I gave him a YouTube link. He said he was impressed and that I should do well with the Shakuhachi, due to my music background. Also it is like the harmonica but much much more difficult. He is a fan of Muddy Waters from back in the day. He like the song we did and looked up the lyrics and music. I think this will be perhaps an interesting connection down the road. I am writing this just before going to my second class, so I will finish this later. Just in from class a little while ago. Interesting. My class is listed as 30 to 45 min. I was there from 7:30 until after 9:00 ! I took a few pictures of Sensei’s Shakuhachis tonight! Some of what I learned tonight is, this linage style of Shakuhachi I am learning came from the Zen Buddhist Linage…Kinko – Fuke Sect. Karmic or what?! I did not know any of this in the beginning. I just wanted to play Shakuhachi and was lead to him, by “the Force”. My Chan Shifu (Sensei) is from the branch of Zen, same as the Fuki sect, Rinzai. Also the old licensing system is still in effect. 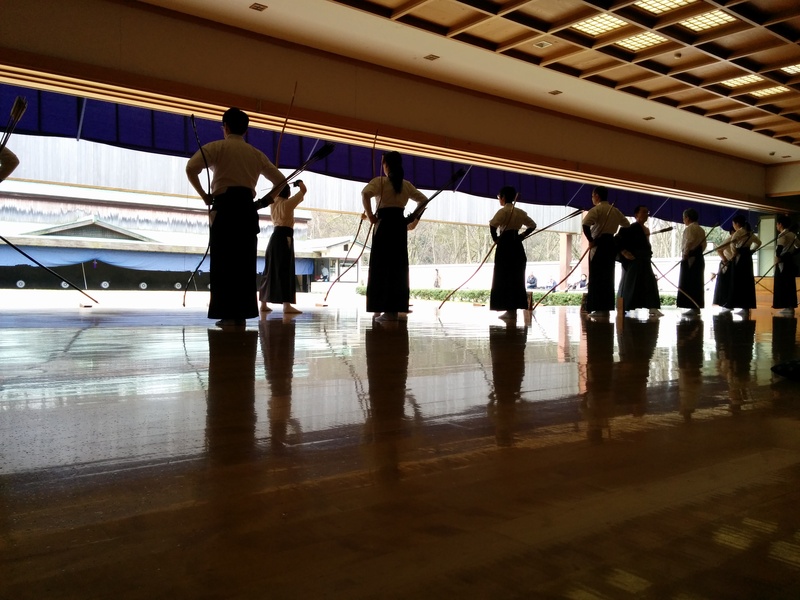 Meaning it is like Kyudo, Akido, dance, etc. you have ranks, and the higher you go the more you pay. My sensei says he does not follow that system, he thinks it is bad. Therefore his disciples have no ranks, (dans) . 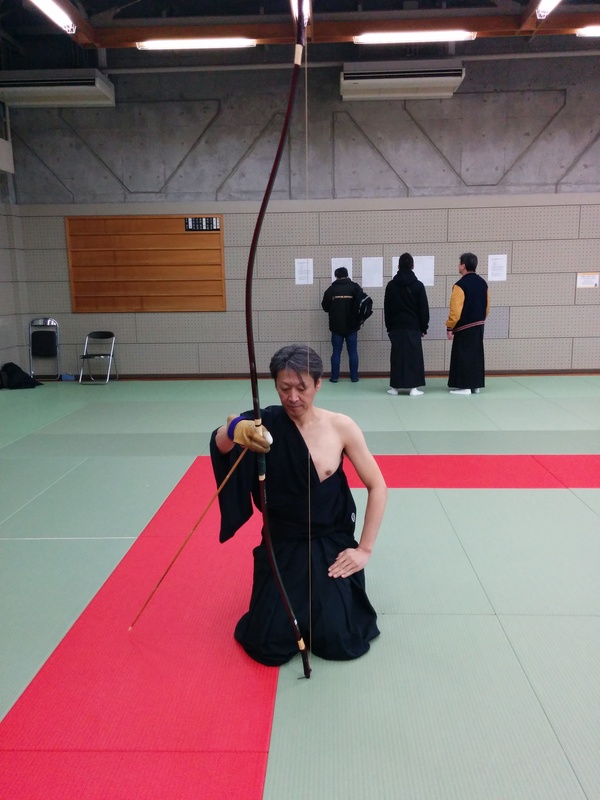 I was surprised when a Kyudo Sensei told he was such n such dan in Shakuhachi. Japan is still very much a land of contrasts. Modern , yet Old. Anywho, I am not doing this for rank, and that is perfect Sensei does not do it. That saves me a lot of money. .So sensei said he generally has a printout and gives a talk on the history and traditions of Shakuhachi if I was interested he would have 10 min or so of my class for that in the future. Cool I said, but not using that word. Music wise I am on drills and breathing, making the proper tone. Smooth solid tone, no vibrato. Breath and posture, highly important… Where have I heard this before. So learning this Traditional instrument is going to be not just a music lesson , but history lessons on an ancient culture, then and now. Perhaps some interesting reading for my five or six followers. I think there will be some interesting adventures coming from this Shakuhachi Do. 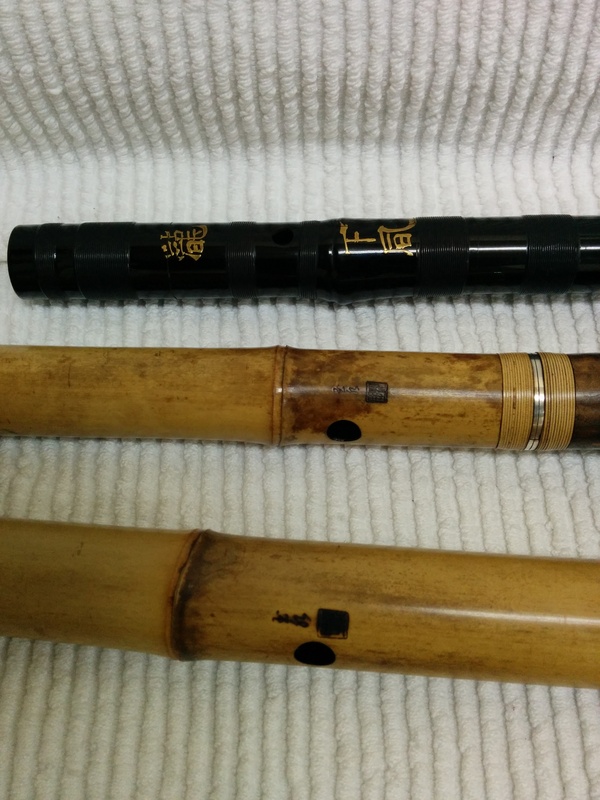 Sensei has offered to take me at some point to visit his friend’s shop, a very famous Shakuhachi maker. Also I will later down the line be doing some duets with some Shamisen players Sensei knows. I have an aquantance who teaches Japanese martial arts, is an accupunturist, plays Shamisen , I think there will be some interesting music born in the furture. sensei has already suggested perhaps us doing a musical colaboration in the future. Me on Bass, him Shakuhachi. Interesting path ahead. Certainly not your average expat story(s). I had wanted to attend an opening of the year Tai Kai at Osaka Kyudojo, that however did not work out. This would be my first event there in Osaka. I had thought this was going to be a small affair. Us vs them, kind of thing. Turns out it is a them and them and them and them…vs everyone. I am guessing about 10 other Dojos in the Osaka area. I arrived first of my group, I found my way around to a changing area and prepared. 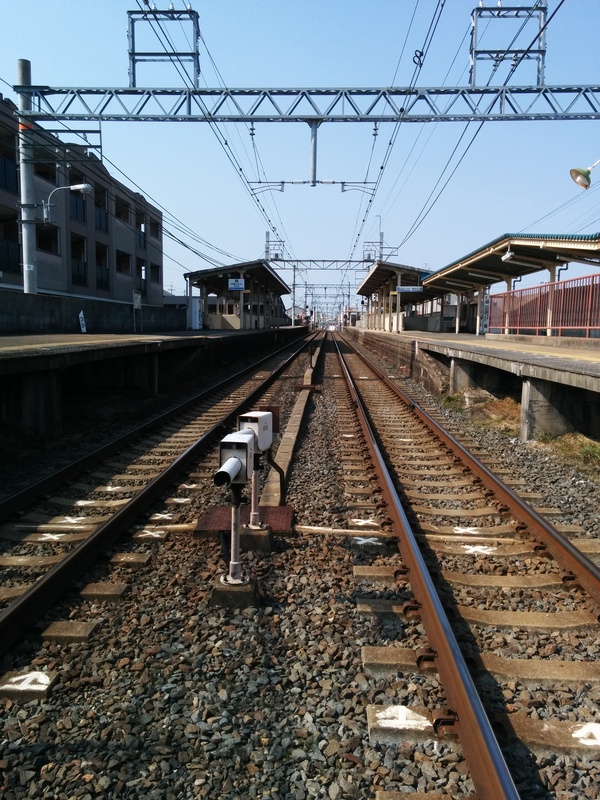 The Kaicho from Kishiwada soon arrived, that put me at ease, I was were I should be. A Dojo-mate showed me where the groups stuff was, I joined them. As I did not understand most of what was being said I just hung out and rolled with it. I did find out I was #2 in the lineup of three. Perfect. They kept it that way throughout the day. “Sugoi” Perfect. I could relax and follow. I am sure they planned it that way. It was to be awhile before out turn was up. So I meandered around, checking things out, snapping a picture every so often. I had my smartphone in my top, it was handy there. I could whip it out fairly easy for those quickies. The group organized, I was on pause. Not to long a wait and our turn was up. We had two teams of 6, I, was in the second. When the first group went up, we sat out of the floor. Took score and clapped when someone hit! Here I learned when on the floor watching you had to be chair sitting or in Seiza. I was told that very curtly by a Sensei in the States. I thought she was tripp’n , but of course I said nothing. 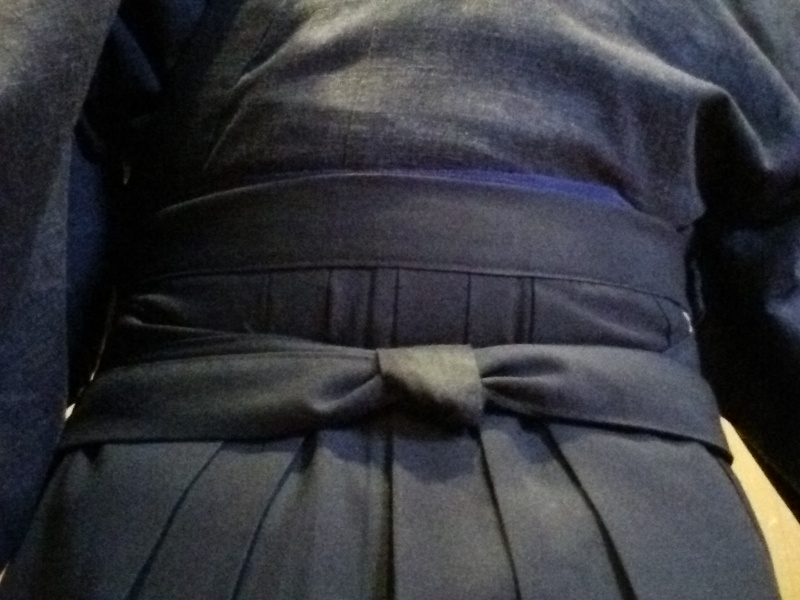 Here I was addressed politely, by a sempai and told the proper “form” and asked if I could do seiza ok. Finally it was my group up. We walked out together nicely and took our place. Our first group got hots but nothing to write home about. I was in the just do your best shot state of mind. No attachment. Missed with the first shot. Ht with the next two, miss the fourth. Pretty much keep that pattern throughout the day. Except for the last set I hit only one. I was up five time and hit 9 shots. My first TaiKai I hit 2 out of 3 sets. FLunch was just after 12:00. The dojo groups gathered together for lunch. Some had group purchased Obento boxes. Other had more and less elaborate lunches. I did not bring any, so as soon as I heard it was lunch break I took off for the convenience store. It was a nice walk, spring weather not a far distance. When I returned I sat outside and watched the passerby. There was a running race going on plus other things. it was a Pleasant first day of spring. Upon returning to the Dojo, I was asked by a couple of people. What happened to me? Did I eat lunch? Was I ok. I said I had eaten outside and was fine. I was given a small bag of snack items later by a Sempai. 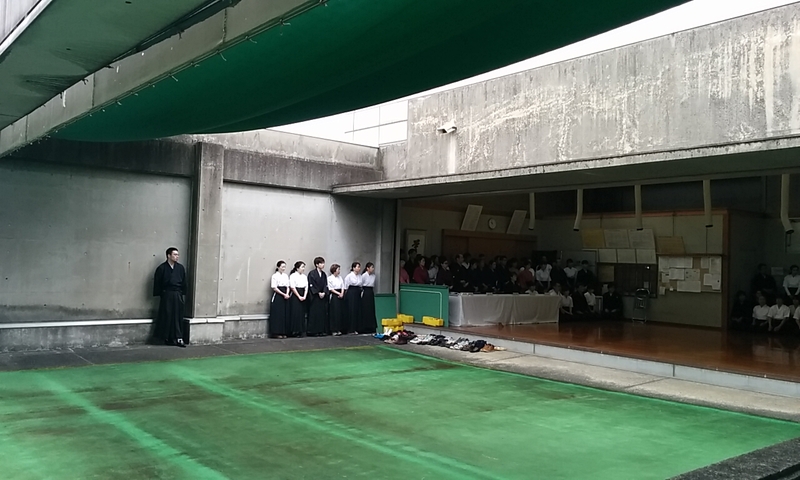 For my first public TaiKai, I think I made a pretty good showing. even some of my dojo-mates said as much. Only once walking on the floor was I aware of being the only foreigner there. No one seemed to pay it the least amount of attention. Maybe I am already known…having been at two Shinsas or … no one cared. Well this was my first outing with the Kishiwada clan. It was fun, I think I am even more now considered part of the group. The next Tai Kai is end of April. I am planning on attending. 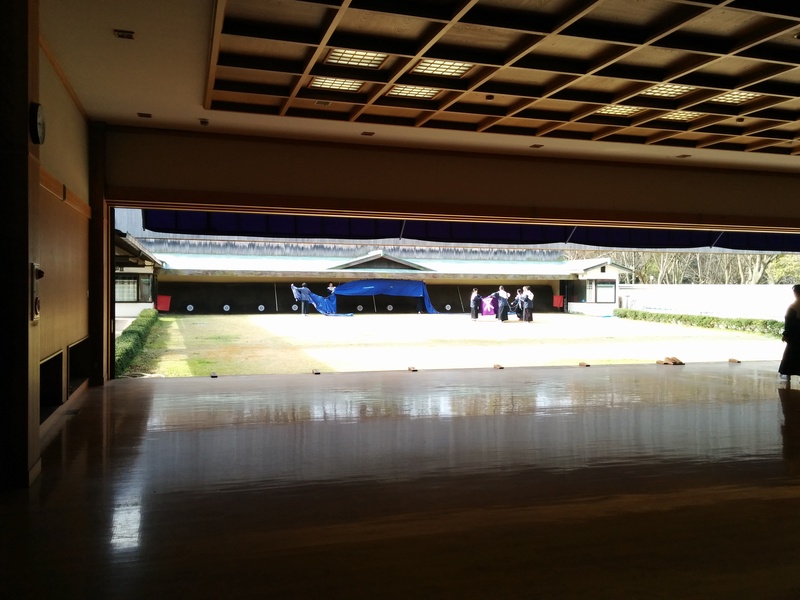 It is sort of far, but I want to visit an old Sempai from the Dojo we are competing at. This is over in our old Hood. Suita-shi. Very nice Budo Hall. I went there to practice only a few times when we first had resettled. It was there and Banpaku. Suita Kyuodjo was closer, but the people at Banpaku where nicer, and had tea together, more homey. ahh yeah, I digress, so I will not doing anything worth posting about as far as Kyudo for a while. I will just be practicing for June. The band has another gig this week. I am teaching sailing a bunch, way more than I thought would be happening. So blogging about some waterworld stuff over at https://zensekai2japan.wordpress.com/. My Second Shakuhachi class is coming tomorrow. So I will be posting about that shortly. I am digging it, seriously. . Finally the day was here. A lot of mental trips before hand. Watched some internet TV. I am so thankful for that. We do not have TV. Some of the shows I love, I got to watch some of them before we left the states, some I just plain missed. I am catching up now, fun. I did some study of the Kyudo Manual. After which I played my Shakuhachi then I did some Zazen/Chan-ding. Followed by off to bed after finishing some packing. I needed to be up at 5:00 to make my train to the Gym! An Hour and a half ride. I went right into the building once the doors opened, it was cold and I needed to get a spot to settle. I got a spot and started to change. At that time one Sempai came in, I waved him over, a short bit after that another showed up. I was surprised there were no others. After a while though two others showed up…and then there were six. We all got checked in, and our place in line and settled in for the wait. We had nothing to do until just after lunch. Saddly for me I once again was Ouchii. I took that as a bad sign. I had already accepted I was not going to pass but now I had to suffer through Tai Hai again as the last in the line up. Sigh I took a breath and accepted the thought of what was to come. Meanwhile, everyone changed and soon it was time for the opening ceremony. It was cold cold! I was glad brought along my Kimono top jacket. It was not a great help but it was something! There opening Shiza was first by a Nana dan or something. He missed his first shot, hit with the second. Next came all the judges, of mixed rank. Five of them. They lined up and shot, all but one missed. I thinking, kind of hypocritical to make another do something you can not, but they did once to get there, so… anyway Second arrow for all. All hit but two. Hmmmm. Went my thoughts. Everyone returned to the staging area and the process began. I like most of the others in my group studied for the written test. We all hung-out, studied, some napped. I met finally a “friend” from Facebook a Kyudo connection. Last year she did nto attend, but sent over her friend to welcome me and gave me a little snack to eat. It came in very handy, I did not bring food or plan on it. I was hungry hungry. This time I brought my lunch with me. Anyway met her finally she was testing for Ni-dan. The lower ranks tested first…. 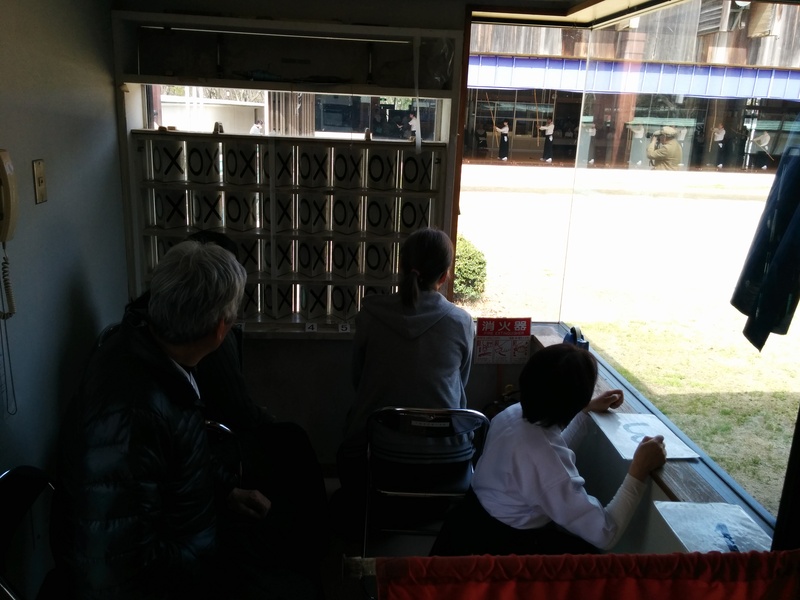 for the most part we from Kishiwada all had lunch together and did the other groups. Pretty normal I guess, I am just use to going off somewhere and quietly eating alone. After lunch I like the others got ready for some Makiwara shots. Little by the little regular Senior Sempais came in and joined our group. I guess they had been told earlier what time we were starting and arrived in time for that. It was good to see them all. Now there were about 12 or so of us. I had come across some of the members from Bampaku that I knew earlier. They had a large group I only knew a couple of people. One of who was also testing for Yondan. Anyway it was nice to have the Kishiwada group there. And so it started, first we took our written test. I was told what to fill out where on the answer sheet and helped by a woman who spoke basic English. Then another head Sensei gave me the questions on a sheet, told me which one goes where. Got it! A short while later a fair English-speaking Sensei came to check on what/how I was doing. It was all good. Once finished I handed in my paper, the first to be done. Really the same question I had last time, so no sweat. After handling in my test the English speaker said oh boy more work for me. Sumimasen, I said smiling, he laughed, saying daijoubu! On that note I left, the easy part done! Now for the hard stuff. 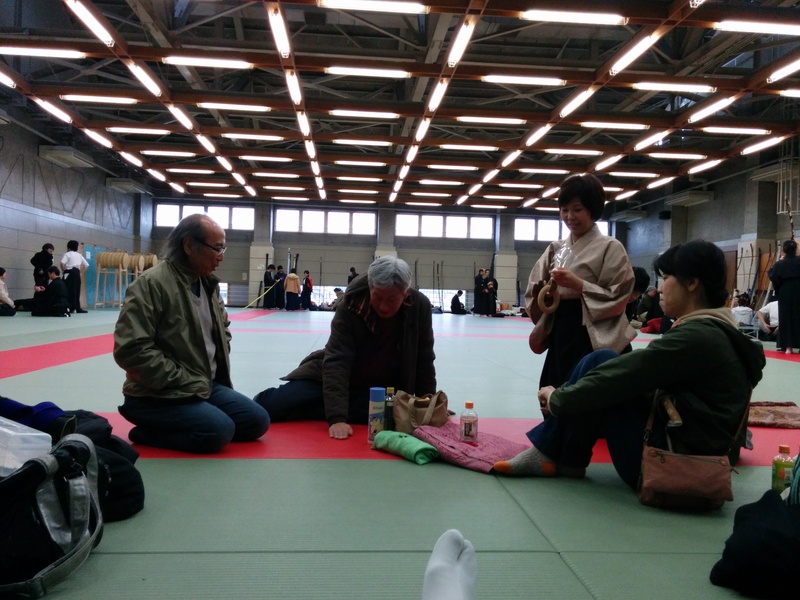 It was still a short whole before everything was in place for theYondan testing. I was in the first group 😦 ,Ouchii!! 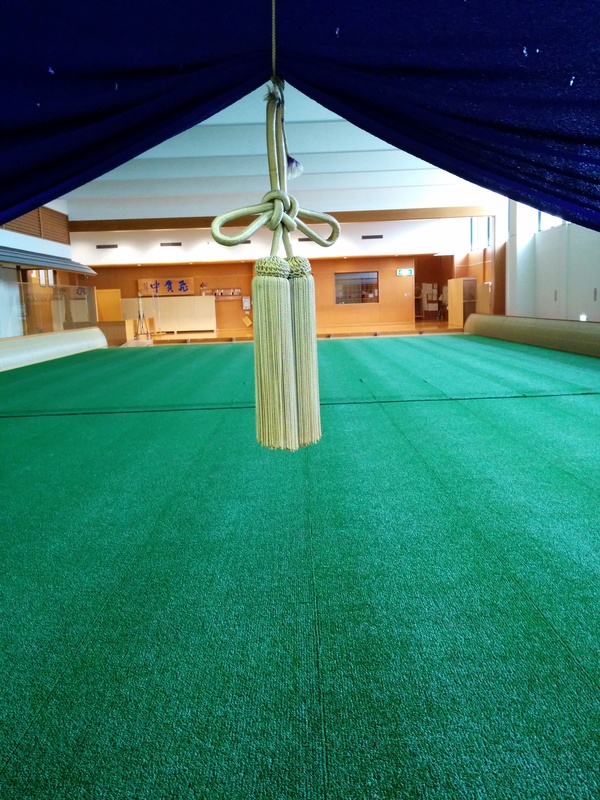 San-dan began to prepare various ways….like this picture below…I said they were doing Zen in a real Martial Art Kyudo Environment, on a FaceBook forum ( Having been told I would be better off at one that was not a real Martial Art based Dojo in the States by a Sensei there, because my email address had the word Zen in it. 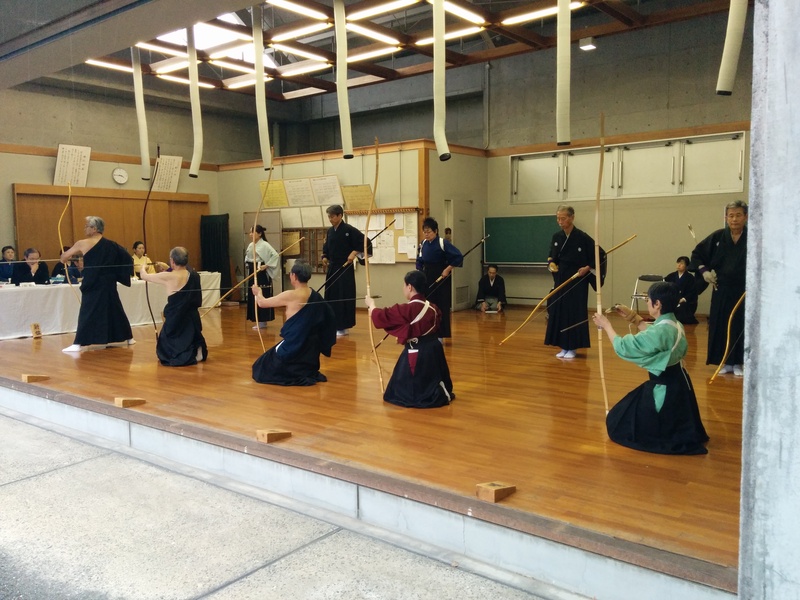 I should go elsewhere to learn Kyudo, I would be happier and fit in. No questions about me, only seeing my email address) and OMG what a firestorm of comments. It does not take much to stir up the Zen Haters. Kind of funny. 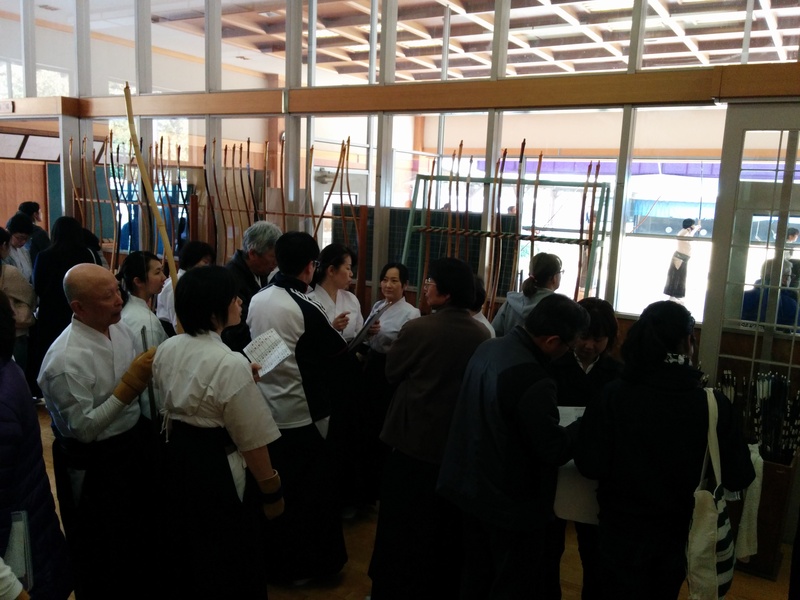 There was an announcement and everyone ( yondan test) got up And started for the door. I asked a sempai what is this? Do I need my Yumi? Is it now? A meeting, I am told but bring your Yumi to the staging area, in so many words more or less. In the mian dojo the Sandans line up. A lot is said none of which I got. I did figure out after a bit that some of it was, testing for YonDan was serious business, they would be checking certain items for content and quality. The they listed what they were going to be looking at. They ended with Ganbarimasu! We lined up to go on the floor. It is a tight area, I kind of hang back and let the leaders get organized, …and they start. I join and prepare to step, as I am about to, step onto the dojo floor I feel someone adjusting my sleeve, this throws off my attention and I step out on the floor with the wrong foot. Doh!!!! I think, oh great well all is lost for sure now, I know the judges saw that. I go through the rest of the formalities. I kneel, ok, I figure I have already blown it and being last, no one can see that well, so once I lift my knee for the knocking routine, I lightly touch my left knee back down to lessen the strain I know is coming, as each arrow is slowly set free. Maybe I should just learn the standing form, I think to myself. Ok finally my turn, I stand, lock and load. Show time. I draw thinking only of the steps. I release, the ya hit, everyone looks, just barely inside the mato. I re-seat myself, now just thinking about making through the next session. Not too bad with the hidden light knee, not pleasant but, doable. I am up again, set, line up, release. Softer noise this time, not the sound of a hit. Still everyone looks. The ya is right next to the other but just 1/4 in outside the mato, the sound was the Ya hitting the outside edge. Ok, all done here wheww. I made it through, no prize but still I am feeling a sense of pride that I made it through and my grouping was tight, off, but tight. I exit and head back to staging area one to change. Next up, after I change are my other Sempai. Time to have moment of joy or sadness. I and the others watched as they all took their turns. It was raining and cold now, really raining. Out of our school Yondan test only one made it with two hits. Still everyone was in good spirits even the Sempai who had already tried now 14 times! We had donuts, and sat around chatting and joking, waiting for the finally results. Once in the lower Dan ran to the board to check, those who passed jumped up and down! My sempai and the other went of to check the Yondan group, yup our dojo just had one, he had passed! We all congratulated him! It was all over now. 3 out of 55 passed the Yondan Shinsa. Serious business, Yondan!! I had found out that the next Shinsa for Yondan was not at this location as I thought, but at Banpaku, my first Japan dojo, that excited me. I thought perhaps this is fate to return to my starting spot for Yondan exam. Perhaps Nogami Sensei’s spirit will be there and help me, even if not it would make him very pleased if I could become Yondan there. That would be epic! That is my goal now, Yosh!!! 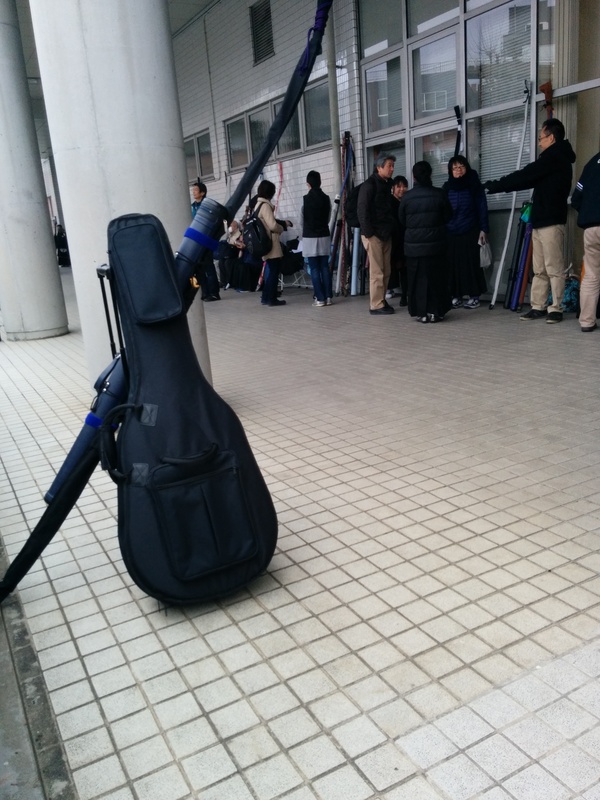 After all this I headed to another part of town for some music connections, visiting and friends at a local club.I am loaded down, Kyudo gear and my Bass…under crying skys. I came across a band member and his girlfriend. I chatted here and there and had a salmon wrap , hmm yummy with home-made Sangria to wash it down. Nice, good feeling about the day, full stomach, a lil buzz from the wine…Life is good. I head homeward. 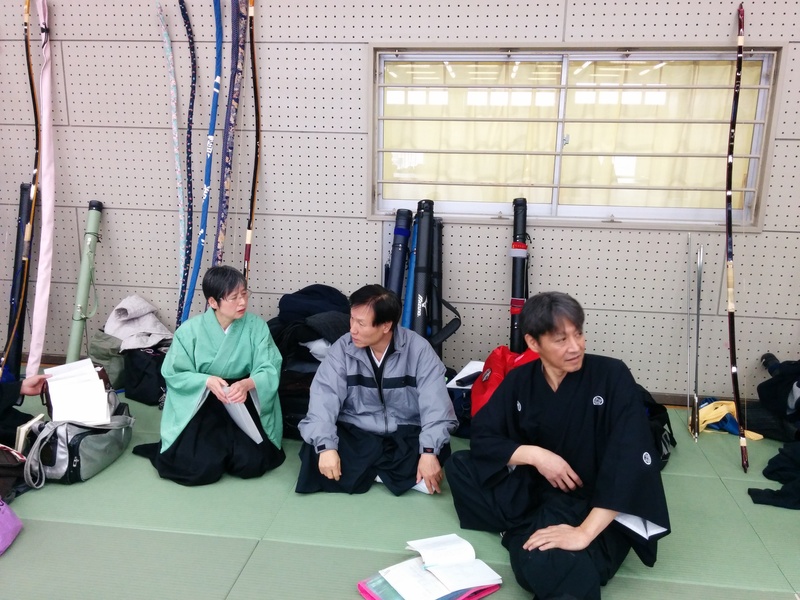 Now I thought my Kyudo brain was down for the day except for planning what training was needed for the June Shinsa. Well I was wrong. I am almost home, changing trains. A guy give me the once over and asked is that a Yumi I have. I tell him yes and he starts talking. He is a Godan lives nearby. Next town over from me in fact. We chat all the ride home to my stop. Nice guy, a couple of years older than me. I give him my card. Perhaps we will meet again. He was interested in Kishiwada as a another practice place, even more so when I showed him it was inside! A pleasant ending to a pleasant day. 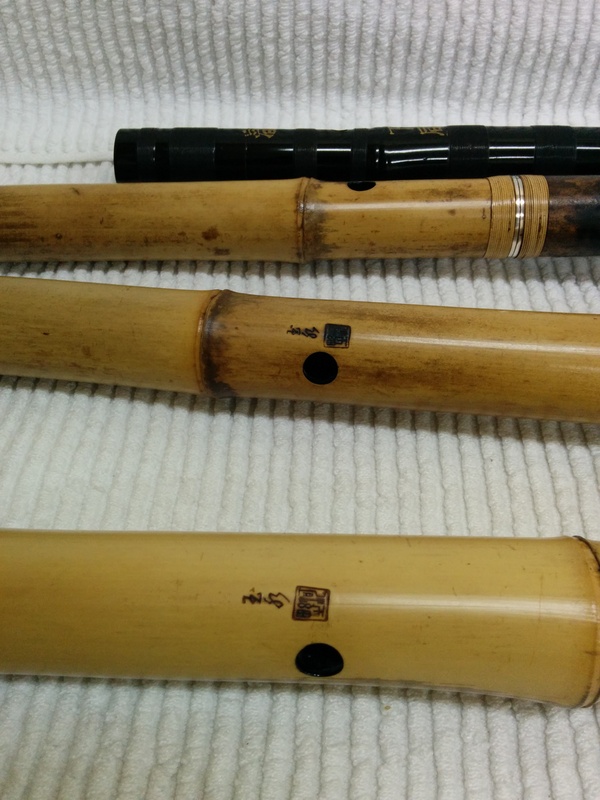 Now I have my first Shakuhachi lesson to look forward to on Monday…cool!! I am ready on a couple of levels for the up coming Shinsa. 1. For it to be over, pass or no pass. I am ready to move on. 2. Mentally ready for whatever goes down. I am back to the mind set of ok, most likely I will not pass so, ok I will just enjoy the experience and do my best at the moment. I went to practice today. We had a dress Tai Hai with several people, one of which is also going for Yon-dan. She is one of three others that was testing for Yon-dan when I was testing for san-dan and did not make it! Yikes! There are more SanDans than I thought there at the Dojo. Plus a Sempai who helped me when I first started at Kinshiwada. So that is four others that I know of that are making a second third or fourth try. The one guy who passed when I did SanDan said it was his 4th entry. I am back to the snowball in hell chance idea mind set. Oh well as I said, I go for the experience. I have made some progress on my skills, this I do know. No one tells me but i am going by what they do not say. I was access my shooting again today. Problem is I am like the weather, changing daily. Today i started bad, but got better as I went on. Not good but better. Also some advice on my Tai Hai from the Kaicho. 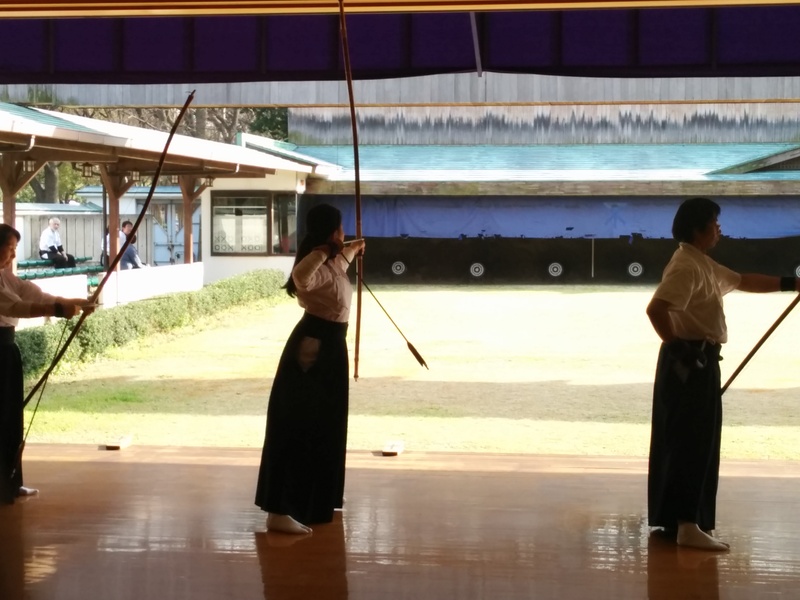 Kyudo is a work progress, that is one of the challenges of it. Sometimes I see Sensei and the Kaicho being told something they should correct. Not by an advance person but just by someone they asked to watch. I see a pattern as it is generally chest expansion or back arch. I found today when I am going into Kai, when I have everything in place before I reach Kai, adjust during Hikiwake, I shoot better. When I try to adjust once in Kai, the shot fails, sometime badly! I met another Yon-dan today she said for the time I have been doing this San-san is doing good. Usually it takes longer. That was a nice bit of a pickup. She asked how I was doing today. 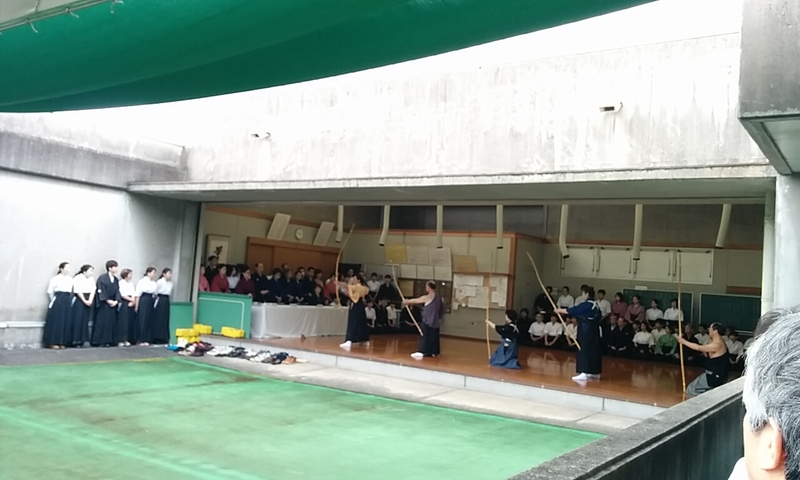 I said, my Kyudo is like the weather, today cold and raining tomorrow warm and sunny. She laughed. So yeah, anyway. I have learned a lot over the last few weeks, it will help on my next attempt in June. I should be more consistent by then. I will go to the Dojo tomorrow for a small bit of shooting to check a couple idea, but at this stage and time for the most part what is in place will be in place and I am just looking at the joy of the experience. There is a person I have been speakng with from time to time , via Facebook, I will finally get to meet. She sent her friend over to meet me last time I was there at this dojo, which is her home Dojo, and sent me a small gift of a snack. That really really came in handy as I did not bring lunch or anything. This time I know better. There is a Zen meeting tomorrow. I decied to pass on going. I will go into the dojo early just for a few shots, then head back home, and relax for the evening. Get my items together for Sunday, have a shower, do some Zazen, play my Shakuhachi and watch a few movies before turning in early after nice dinner. 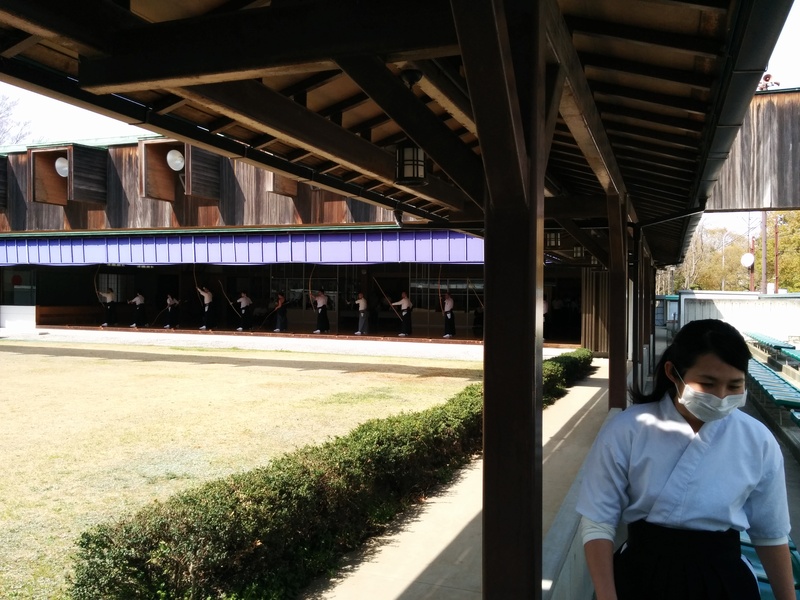 It is great I have something to really look forward to after the shinsa, my first offical Shakuhachi class. Besides whch it will be a busy week. Band rehearsal for the gig the following week. 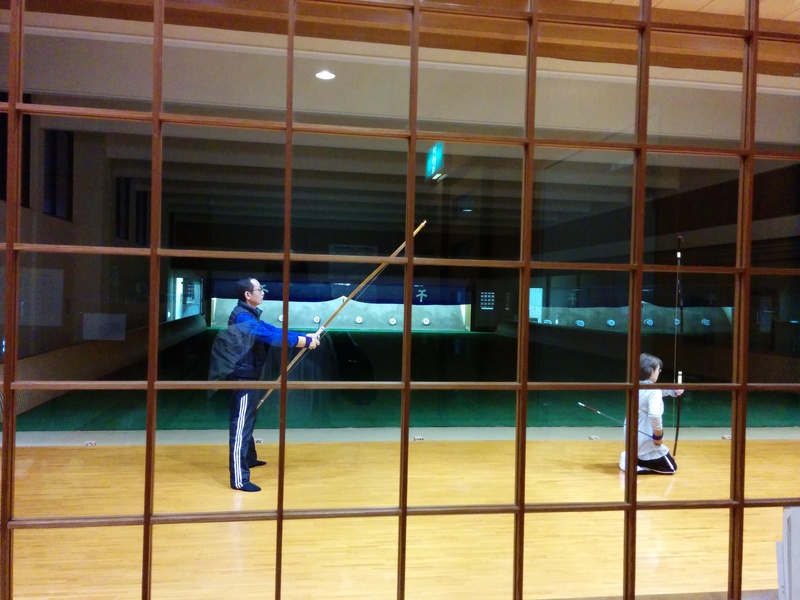 Two days of teaching a sailing class for some Americans and ending the week with a inter-dojo Kyudo Tai Kai at Osaka Castle. June is not that far away…knock down seven, stand eight…yosh! There is one small bummer connected with this. I purchased a new Yugake as a treat for my self for Yon-dan entry. I will need to put it away for later. Not that I HAVE to, but it is suppose to be my treat to myself as a graduation gift…oh well…as said above,…June is not that far off. Steps forward small or large are good. I am making headway. Before my break yesterday I had a 60% hit average. I was pleased. I keep telling myself do not get “cocky”. That means over confidant for those not of American slang hippness. One of my Sempai Sensei saw my score. I said so-so ne! When I get all hits then it will be good. He nodded. After that even with telling, self chill out my score started dropping. Focus was off. That started when the Kaicho came over and gave me advice. Once when I was shooting he was telling me something as I was in Kai, my shoot went Way off! 😦 focus was lessened from there. Not relaxed anymore. Last week I told Yamashita Sensei, when I first start my hits are good after a short while they get worse. He said he was the opposite. He starts bad, then as he relaxs he get better. He also told me he would be one of the judges for the Yondan shinsa. Not sure if that me feel more or less relaxed. Not that it makes a difference ether way. Skill is skill there is no playing favorite. I hit or I hit not. The Kaicho told me yesterday that i did not have to worry about if I mess up with the Kimono part. It would not count against me. It was kind of funny, because had no idea what he was saying. It took three or four people saying it for me to finally understand. I got the no need to worry part but not why I not to worry. One Sempai said something about “count” . I went ok, ehhh, “count???”. Finally after about 3 or 4 minutes it clicked. I repeated in Japanese oh, I get it, the Kimono part is no big deal, the shooting is! I am planning on going to Kyoto for Golden Week in May. One Sempai from Kishiwada is testing for Renshi and so is another sempai from Banpacku. 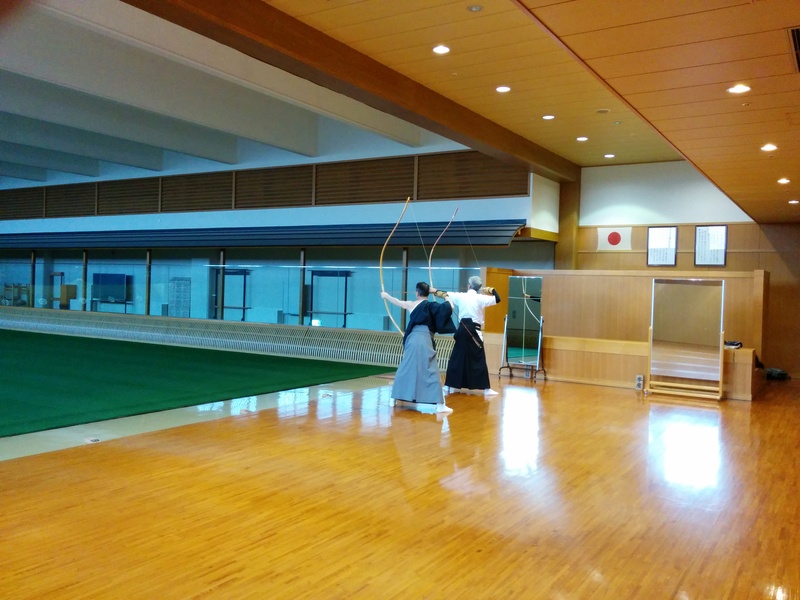 There is also a big advance level Tai Kai and Horseback Kyudo. I may have to make a couple of trips in order to catch some of each. It should be interesting. Pass or not pass, I will not lose. Time is ticking down on the Shinsa. I have been putting in a fair amount of work at the Kyudojo. As in everyday for the most part, I have been the last to leave a couple of times. I had accepted that I was not going to pass with my hitting as it was. However I was going to do my best. As I said last time a couple of Sensei had given me pointers, I worked on them still I was not there. The other day the head of our local Renmei was in. I had not seen him in a while. He said he wanted to se my kimono drill/work. I gulped and said Hai, I have been practicing and motioned through the routine. Not good enough he wanted to watch me. Ok, I set at it. He picked it apart, a good thing, but disheartening even more than I was. Still I took it all in. The Kaicho, said relax, I said yes, step by step. He said Hai! I spent the rest of the evening recalling the corrections. This is what another Sensei came up with a Yoda like quote after I told him, “Even if I did not pass I would still be a winner”. “pass or no pass or will not lose”. I would gain experience, and make advancements in my “form”. The thing is though, the mind, how does one set it. If one believes you write your own story then to just expecting to fail, could mean that you will. On the other hand if you set your mind to win, feel it, form it, you will…So some say. Dreams start in the mind, we make our own reality. Quantum physics say this. However If it does not happen then one is sad, there is suffering. If one setups the mind that you will lose, there is no disappointment, when you do. However if you do not, then there is great joy, one feels lucky, blessed, whatever. 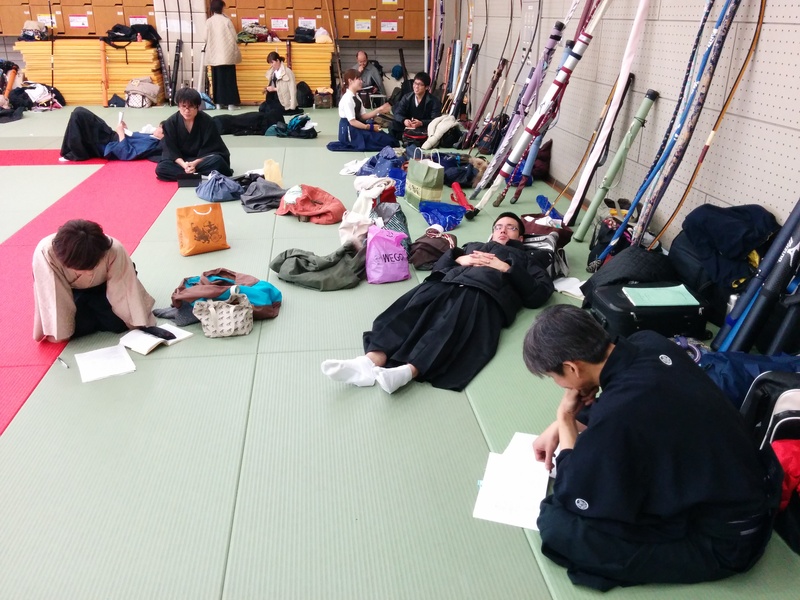 So this Shinsa (Kyudo for that matter) is not just a physical thing, beside having to have a written test, there is one’s mind to deal with. 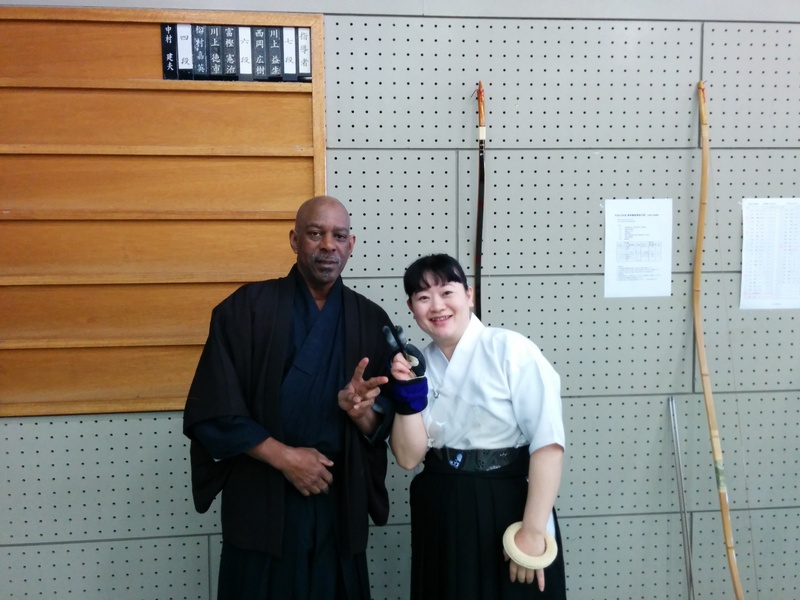 I had a friend go to the Tokyo TaiKai, his mind was SET he would win and show everyone how good his skills where. He had confidence. He lost! Greatly, big disappointment. Me on the other had no thought I would win. I had no attachment to it, I just shot and ended up in the finals. Big shock, big pleasure. The point, hmmm, perhaps just luck, was with me, but I was not disappointed. On the other hand with my first San-dan shinsa, I did not really expect to pass and did not. Some disappointment but easy to roll with. The second, Sandan Shinsa that was a really uncertain one going into it. That was really just being in each moment, much more focused than Tokyo, but a small hope of sucess, but not really attachment to “passing”, hopeful, but not attached, as my hit rate was not as I wanted for that challenge. I was more in a state of yeah, I can possibly do this, with some luck, not yeah, I can do this, I have confidence! Ok, so what am I babbling about. The mind, There are some who have a cow at the mention of Zen and Kyudo. They are so lost in attachment to what they think of as “Zen” they do not see but a small point, a small meaning of Zen. However the practice of stilling the mind is critical in Kyudo, Tai Chi, Kung Fu, Aikido, Judo, Karate and that is one aspect of Zen. One can put a label or not on it. The label is just a way to refer to a tool for use. Like hey Joe pass me that pipe wrench,, rather than Hey Joe pass me that “thingamajig”, some tool are specialized and some like slip joint piers can have several uses. A road from point A to point B, will get you there no matter if it is paved, has trees, lights, dancing-girls, yogurt stands, or nothing. There is a Taoist saying about the usefulness of a cup is in it’s emptiness/ hollowness. 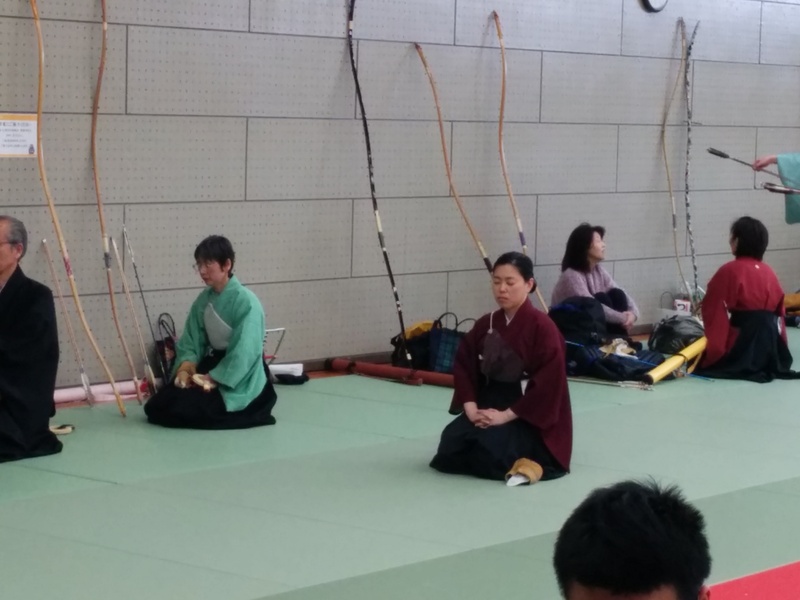 So whether one calls the usefulness of Zen training in Kyudo; Zen, mindfulness, stillness, emptiness, or george it is the function that is useful, the name means nothing. Ok, yeah, I am really digressing here. The mind, controlling the mind and non-attachment to the end , only the fullness of each step. That is what I am about right now, or at least trying to be. So yeah, I have been doing this fairly intensive practice. 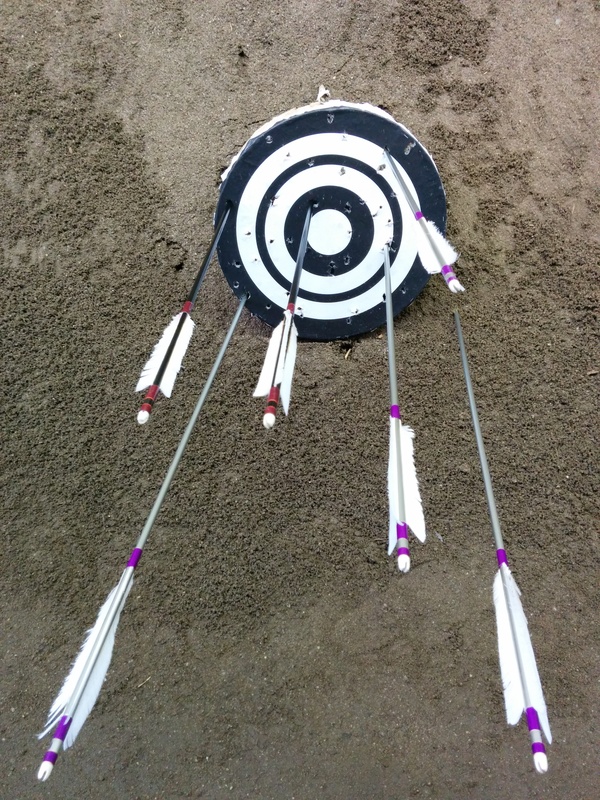 Not doing the 100 arrows thing, but more so the each shot matters thing. Today I had a break through. I sort of had it last night when it dawned on me what I was doing wrong, hmm more the what(s) things as in plural I was doing wrong. Did not get a chance to test my theory as I was burnt out yesterday by the time enlightenment arrived, and crashed the party. 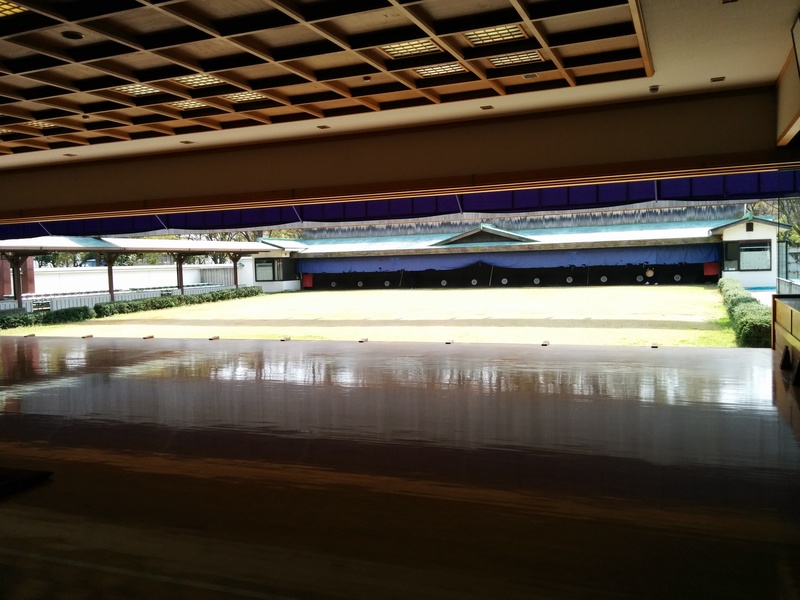 Today after the Kaicho and others left and he had taken care of a few other questions I had and I got in some practice on non-shooting stuff, the Dojo was mine. It was great. Over the last few days my shooting average was at a low of 16-20%. Today it was the highest up to 58%. Whoohoo. I had a break through for real. I tested my ideas and they worked. It was not big things, but small things connected that made a difference. Several of the things Watase Sensei had said clicked. Expanding the chest I said to a statement of his. Yes but really more Kokoro he said. 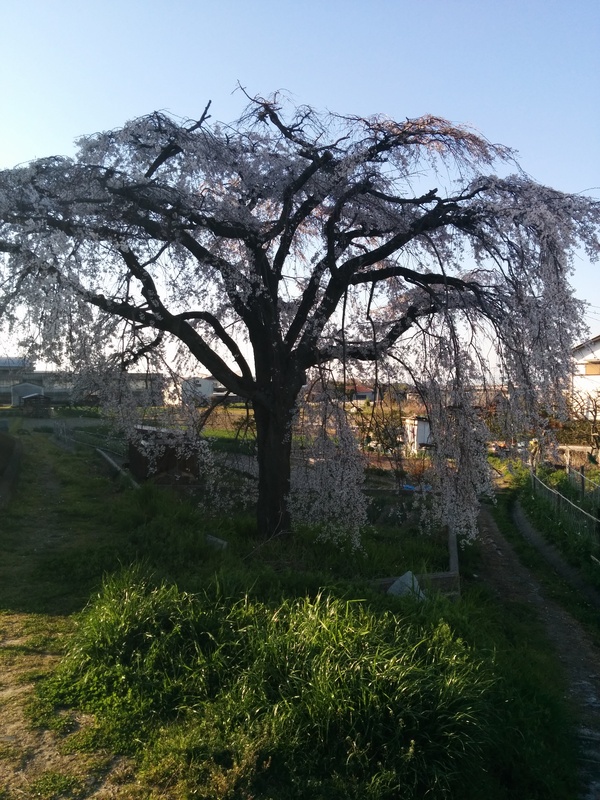 Yamashita Sensei had said straighten the back more, arch The Kacho had said. Do not your stop arm Watase Sensei said go back with it, not back and over like I had been but directly back. Do not use the muscles in the forearm, Watashi Sensei said the muscles under the arm, but not too much Yamashita Sensei had said. You are pushing too much causing your left hand to open. Today it all clicked! I felt the correct muscles, remembering feeling Sato Sempai triceps, not turning /rotating my left arm so much put the muscles in place just enough to give me support from dropping my arm, but still enough to rotate the Yumi, but not too much to cause little finger to loosen in Hanare. I could feel the push from both elbows, not from the elbow and the hand/forearm. Even after I stop for a lunch break my hit average stayed high. Sweet. I have a week to polish this and for the first time I feel I have a chance. So within Joy there is sadness, with this new hope comes fear of loss and the greater need to release the mind even more so from attachment to the end and be only in the moment, Zen training. What a circle, kind of like this post. These days I am up against the challenge of passing my YonDan Shinsa. Beside training on shooting, I am working with bring the mental aspects of my other art and some of the physical into training. My shooting has been really sucky lately. I have accepted that I am obviously not ready, however I continue to train just to give it my best shot. Well shots in this case. It will be a training mission. Somewhat like doing push hands with my Sisook ( uncle) knowing I will not win, but I am making small steps in learning. So in this case I found a couple of things falling into place, my Hikiwaki improved. Not so shallow as before, when I arch early, forearm and hand relaxes able to draw with my elbow. Today, I may have made a bring break through thanks to a Sempai Sensei. 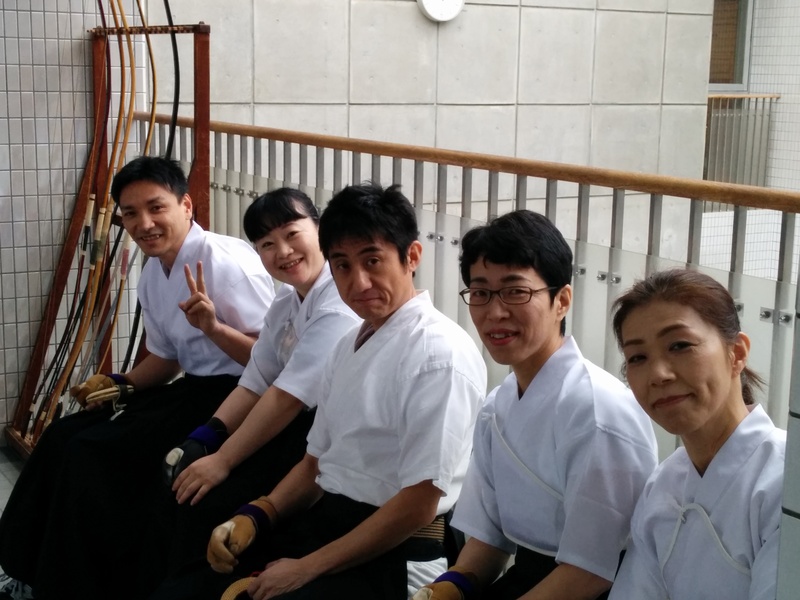 We share musical interest besides Kyudo so we have a deeper connection. He helped me correctly tie my Kimono and Hakama. That was a big deal, now I dress like I know what I am doing, mostly sometimes. my knot still needs work. So the Kaicho has been telling me relax my Hanare, someone else perhaps Yamashita Sensei was telling me just to move my forearm. Today it made sense and it clicked. Both Sensei’s said yes that is it. My Semapi Sensei told me I was twisting when I released. I found when working on not twisting, instead of tighting to stay in place not putting so much effort into staying in place. My right arm did not go straight back and over. It just opened to it’s natural curved open position. My shot when straight. I asked the Kaicho, I do nt need to extend my arm so much upon release. He said no, natural position. yatta! Now my shot where hitting center of the mato but still low. Still that was an improvement They where going low and to the right. Good grouping, but alway low and to the right. Now hitting low and center. Sempai Sensei watched me again he said, you are not holding the ya parallel to the floor, you tip is own. Change your aim point on the Yumi. I lowered it, it helped but I am still a bit low. My time was up before i had to chance to find the sweet spot. However, I went home feeling encouraged instead of frustrated and bummed out as I have been for the last few training days. I am not going to let my mind go crazy…at least until I can test this out. I am putting in as much time as I can over the next couple of weeks. I will make a good show of myself. 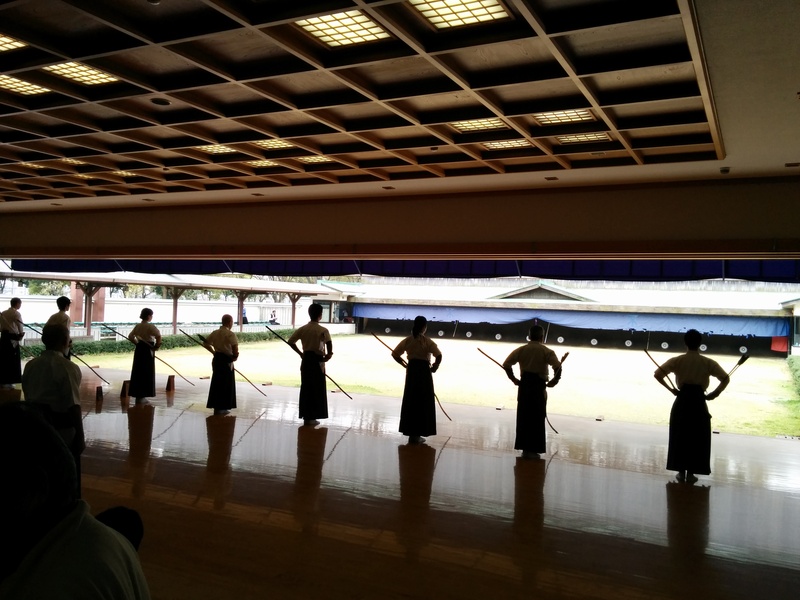 There are three or four other San-dans doing Shinsa that I know of from our school. Two of which tested when I did Sandan. 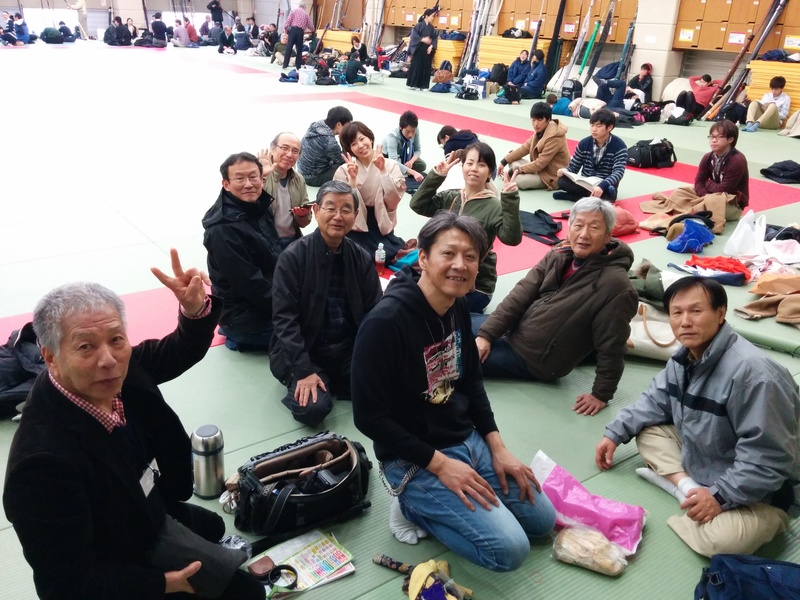 All of them are on their second, third or fourth trial at Yondan. Yondan is a big step. I know people in the states and elsewhere, who tried for years. Some of whom are still trying. Outside of Japan though it is a once a year shot. 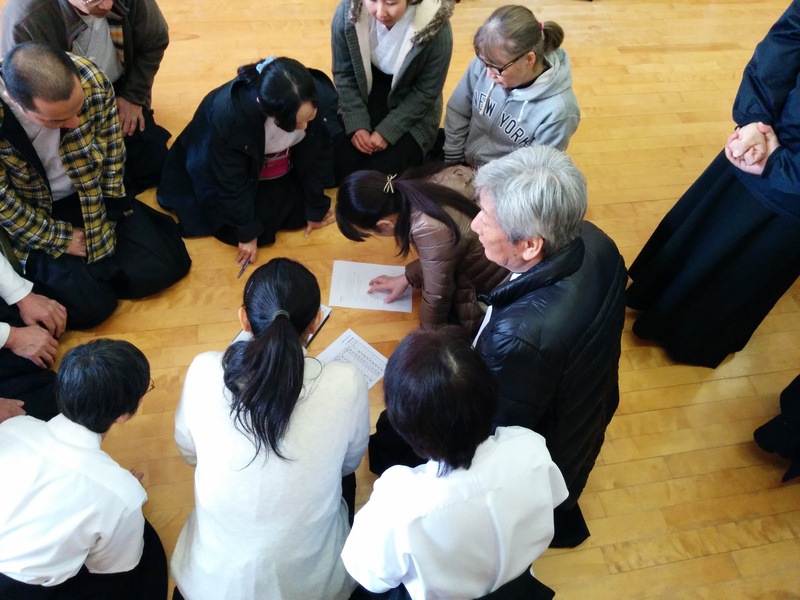 I will have a worthwhile practice run at the working of a Yondan shinsa, where to be, when, and the steps. Beside being more complex than in the states, the dojo it is held at is opposite our home dojo, we step in with the right foot, leave with the left., 😦 Anyway It is nice I only have to wait a few months to have another go at it. Either way though I am making progress, and that is what is really important. One step forward is still one step forward…Yosh! Beside all the testing stuff, this will be a much more fun experience with my dojomates, now that I am more connected and there is a fairly large group of us going. The following Sat. It is a Taikai our Dojo vs, Osaka Castle Dojo. This will be my first TaiKai outside of the school. If nothing else the Shinsa will help my shooting for that challenge. When I first gave the thought to really being in Japan. There were several things I wanted to do. 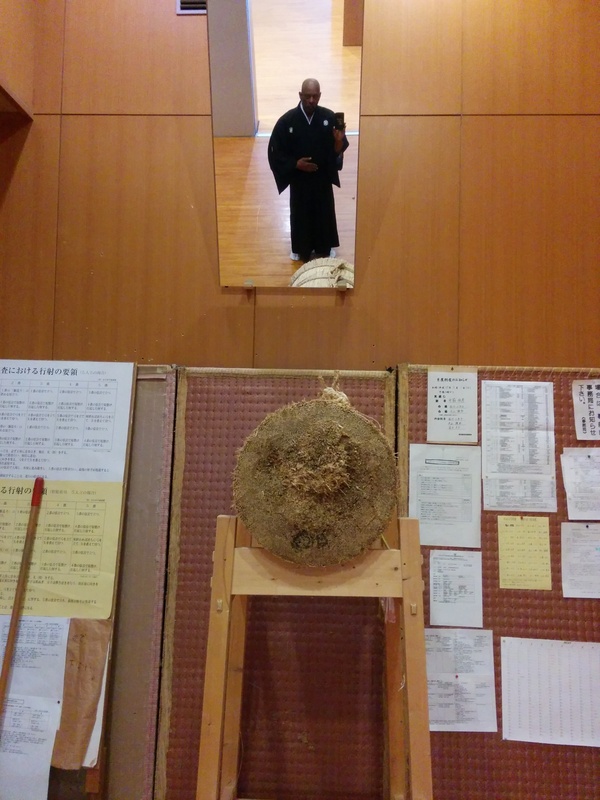 Study/ practice Zen, learn Kyudo, continue with ceramics study, and learn Shakuhachi flute. By learning i did not mean just to teach myself and play by ear, like what I did with the harmonica I wanted to really learn it, as from a teacher ground up. Well I am kind of doing the Zen thing. I have my own teacher however in Taiwan, I do however have a place here I can sit with a group once a month. However, I really prefer my own Chan practice over what I have seen of Japanese Zen. Nothing wrong with it, I just prefer for me the Chan path. Kyudo is full on, as you my few readers know. As that is what most of most are about these days. Not all but, yeah most, LZ has pointed out. So , yeah anyway, Kyudo is full on. I have 15 day to go until Shinsa. I am not really feeling, like I can Ace this. Nowhere near that, however I will prepare and do my best. More on that in another post, this is not about that. The next one is. However due to another matter ceramics are put off for now… Maybe a year. Sometime last year, when I was out tripping around the neighborhood I heard the sound of a Shakuhachi. It was coming from a house I was passing by. I recalled that house a couple of times as I made the occasional pass by. I rarely went that way. I have found another path to the train station, which changed my walking/ bike riding route again. There is a junction on this new route, basically I high road and a low road, mostly I take the high road. Sometimes I take the low, this road seems just a wee bit shorter, maybe. Sometimes I wonder the other day whilst running a judgement comparison I took the low road. This road comes out of a series of alleys right at the Shakuhachi house. Then I turn and walk pass it on the front side to go to the train station. This one day I hear the Shakuhachi again. Hmmmmm, I get the seed of a thought. 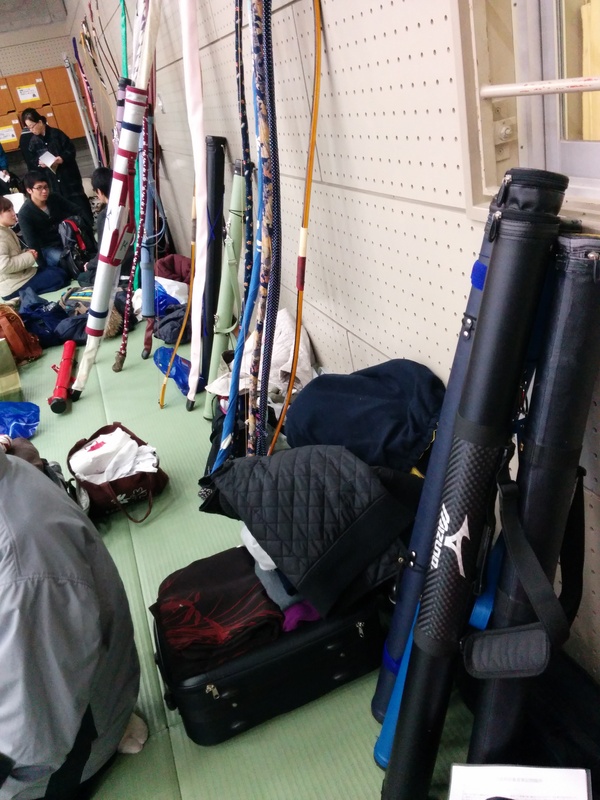 At my Kyudojo are a couple pf people who play Shakuhachi. I had asked one of them about where I could get lessons. It can about that one of the players and another Classical guitarist, also a Kyudo Sensei played together and suggested we get together some time a play. I am thinking of sort of a jam as I said I could sort of play Shakuhachi but I really wanted lessons, kind of get together. Or perhaps guitar , Shakuhachi, Bass kind of Jam. Ether way was ok with me, but I really wanted the lessons, but whatever. A few day later I brought in my two Shakuhachis to be checked out by the one guy who spoke to me about this. He tried to play one, the Bamboo one from America. He took some effort but got some notes happening. It is not an easy Shakuhachi , it is large. A Bass unit. So anyway, he and some other looked it over along with the plastic one I had from Japan. 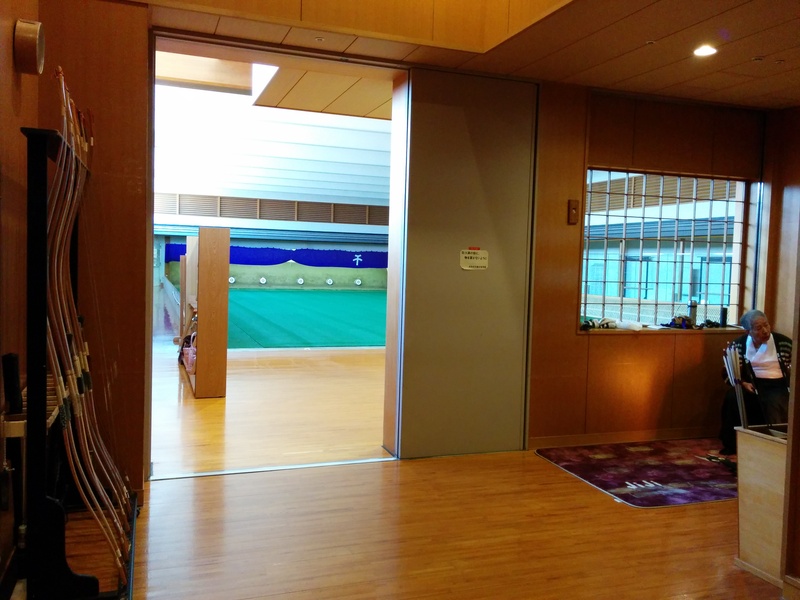 They the guys spoke for a while, as me to play i said no, more casual chatting, and we went on to Kyudo stuff. 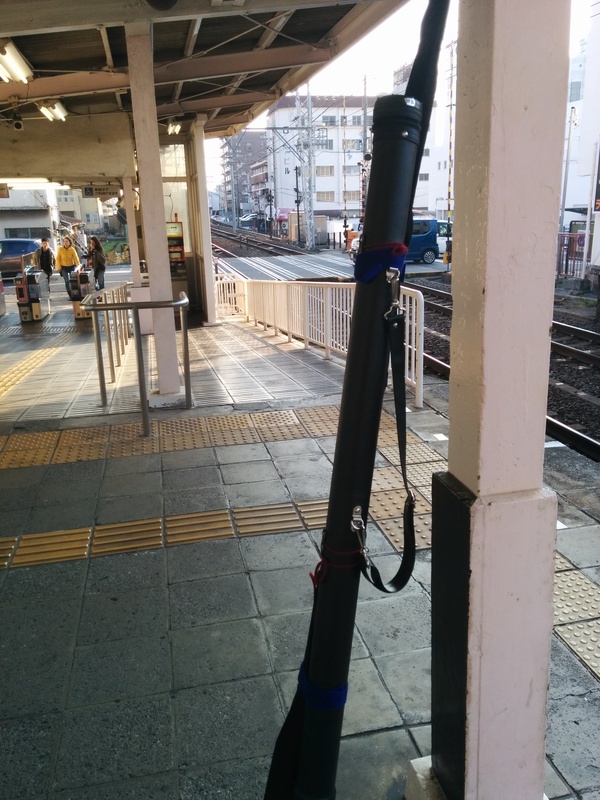 A few days or so pass, on my way to train I hear the Shakuhachi in the house again. The thought rises, how can I can contact this person. Perhaps I can get a lead on a teacher from whoever that is. Walking up to the door would not be cool. Hmmmm…perhaps I could leave a note. I would think this over. On the way home one day, I car pulls into the driveway as I am walking up to the house. I had sort of hoped I could met the person from the house again, as I encountered a women once before a long time again there, but just spoke only about the flowers in the yard next door. Ok so, there is a woman in the car. However, yup again however…she did not get right out of the car as I was walking up, she was doing something. I flash for a brief moment that I could wait for her and asked , who played the Shakuhachi. The flash as I said was brief, I figured it would not be the wisest choice. Unknown Black Gaijhin standing at the car waiting for her…no. Therefore I by, however walked on deciding, I would leave a note later. Later I wrote up something which LZ put into Japanese and I left the note in the mail box on my way out that morning, with LZ’s phone number. That evening she got a call! They spoke a bit and it was arranged that her and I come by and meet this man who played. From there it would be decided what the next step would be. oh well, live and learn. 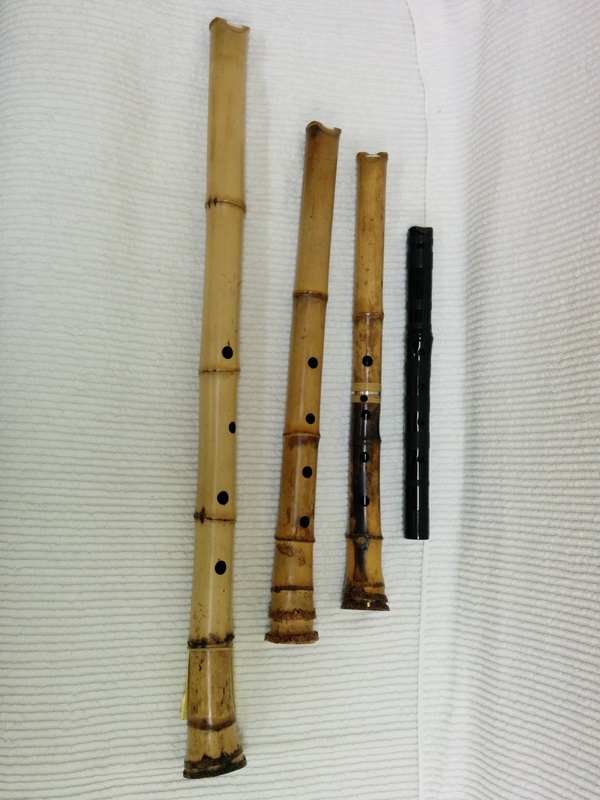 I said I had been looking for a another Japanese Shakuhachi and asked a couple of questions about some I saw as a starter for a student. I was told that I needed to spend about a year learning mouth aperture before I could judge which Shakuhachi to purchase. I needed to play them to choose, properly. Good thing I did not rush to make a on-line auction purchase. As it turns out this man is not just a Shakuhachi player, but a Master. He gives solo concerts and has only a few, very few disciples. His Shakuhachis run in the range of several thousand dollars! He was once a school music teacher but gave that up to pursue his passion. He is a couple of years younger than me. He also speaks English another shock! Not perfect but good understandable English. Talk about luck! He also showed me the modern version of the Shakuhachi which has 8 holes which was invented to play western scales, eg: jazz and such. He asked me which Shakuhachi sounded better. I said the traditional one. He said yes, you have a good ear. The tone is different. I also prefer the traditional one. He went through some history of the Old Zen order that used the Shakuhachi, they were somewhat of street musicians. So he gave us a list of local teachers in the area and also his information. He said he took students on a case by case basis. We should think on it and let him know our choice. I wanted to study with him he had a special hand-made plastic flute I could use until I was advanced enough to purchase my own. LZ said God is with you and lead you to this place. It could not be more perfect, he is a Master, speaks English, lives only a 4 min walk away and is very affordable and private lessons! I of course agreed! “When the student is ready, the teacher will appear” so goes the saying. I am stoked! Another piece of Japan life falls into place. I am looking to start after my Yondan Shinsa. I need to focus on that for the next 14 days…yosh!